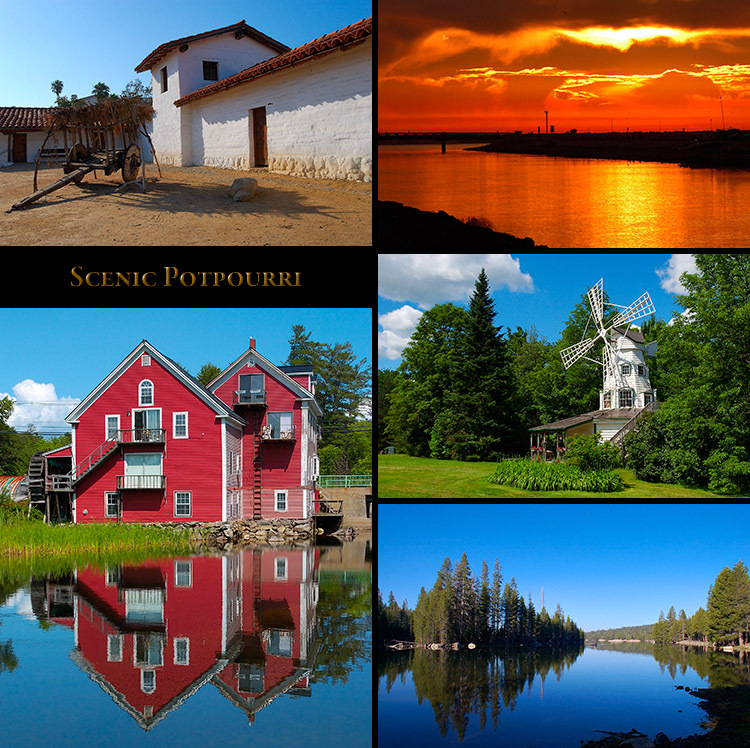 The Banner below leads to the Scenic Potpourri Gallery where images can be purchased. Foliage alongside Bunche Beach in Fort Myers, Florida is painted by the rising sun in late November. received the prize, and the historically black beach on San Carlos Bay in Fort Myers was named in his honor. 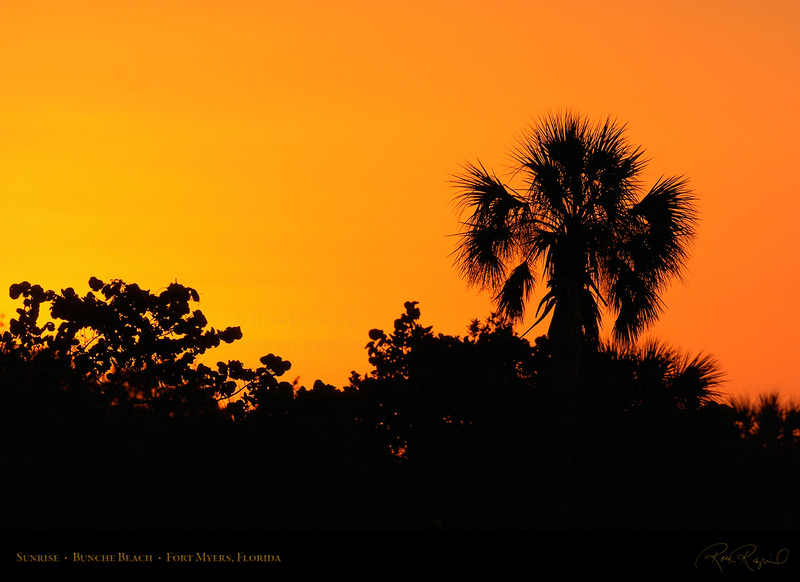 A spectacular Florida sunset over San Carlos Bay, taken from Bunche Beach in Fort Myers. 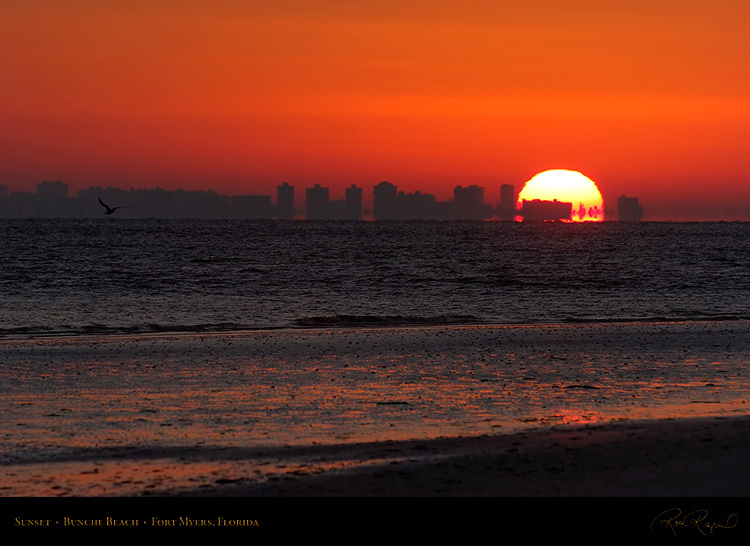 Bunche Beach is part of a wetlands preserve which provides a home for a wide variety of birds. Images of a number of these birds are displayed in the Egrets and Herons Wildlife Study section. by name and small family farms still sell produce and eggs in unmanned farm stands using the honor system. The Hollywood Sign below the crest of Mount Lee, taken near sunset in February. 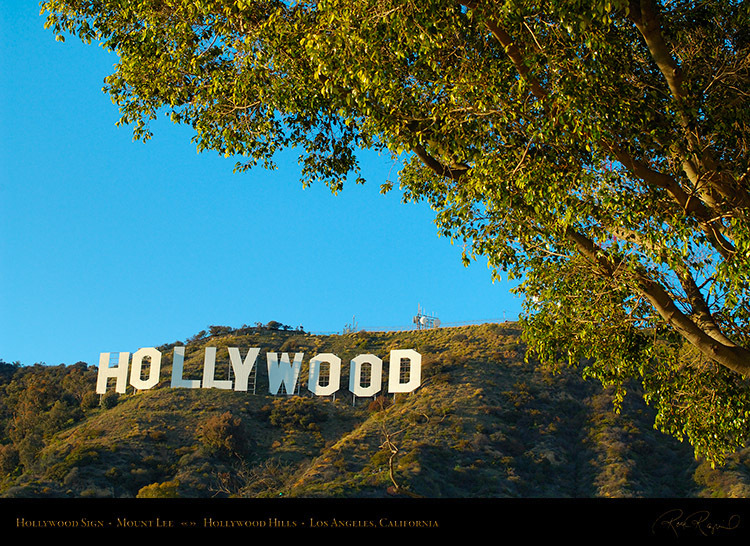 The Hollywood Sign was first erected in 1923 to advertise for the Hollywoodland real estate development. The original Hollywoodland sign was lit by thousands of bulbs and was a high profile beacon over the city. 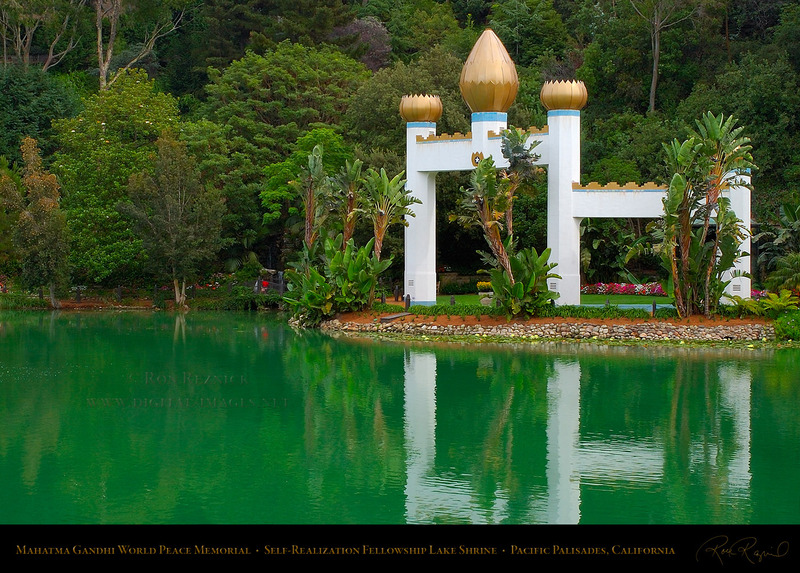 35 foot diameter white dot which was lit with perimeter bulbs on the hill below the sign to attract attention. The Hollywood Sign taken from the steep hillside just below the sign at sunset in February. the day after her death that offered her the lead in a play about a woman driven to suicide. 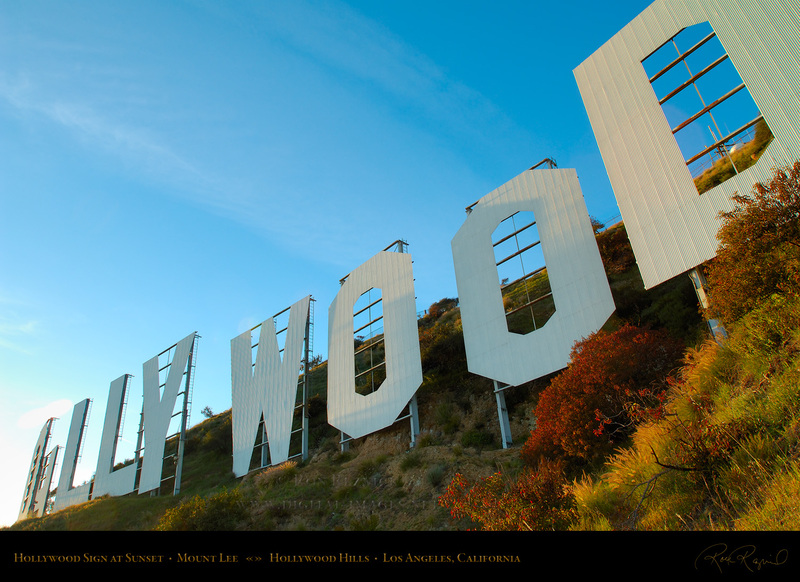 More images of the Hollywood Sign are on the Hollywood and Assorted LA Scenic page. 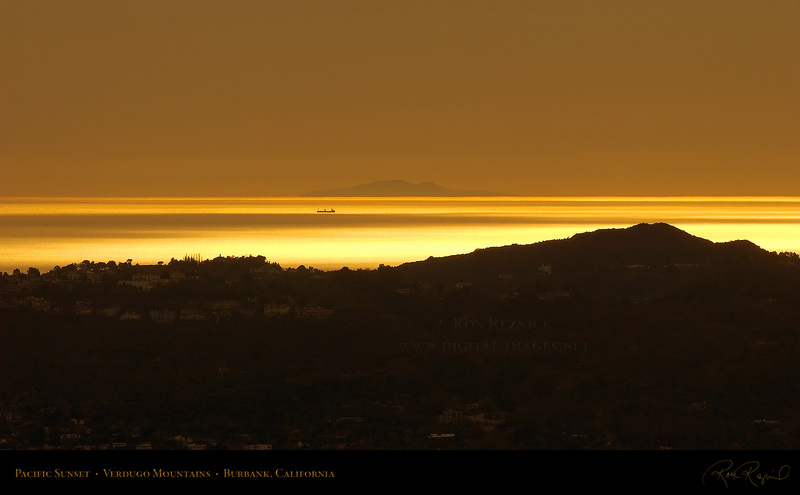 Sunset over the Pacific Ocean, taken from a trail in the Verdugo Mountains above Burbank, California. 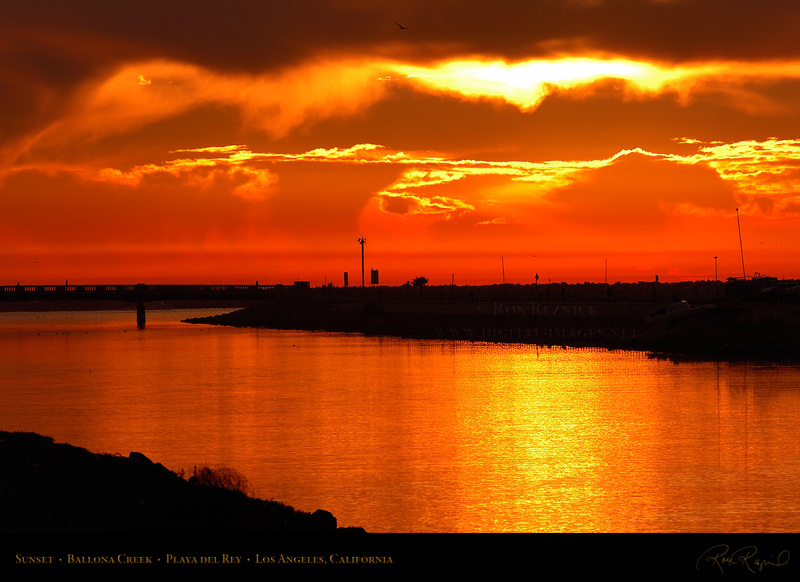 A spectacular Pacific sunset over the mouth of Ballona Creek south of Marina del Rey, California. grant which was named for Baiona in northwestern Spain, where his family originated. transport lava to the Pacific, as seen in the Tommy Lee Jones film “Volcano”. 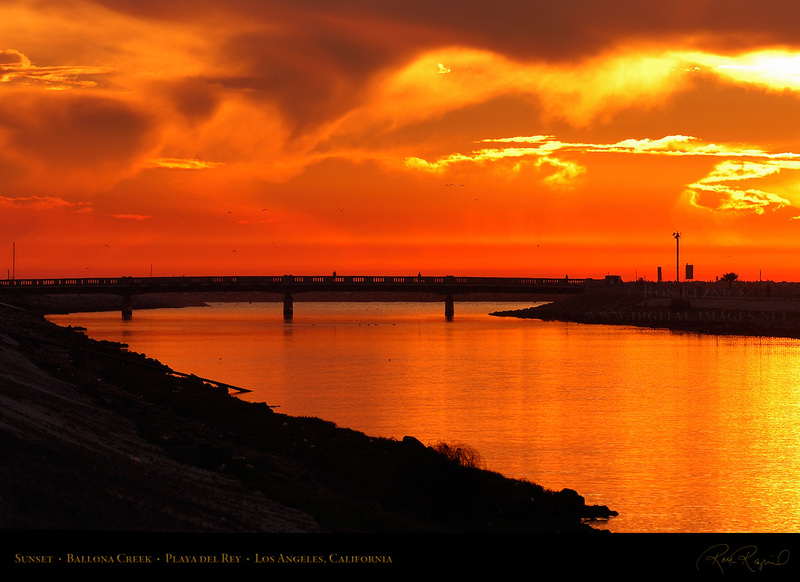 The low angle rays of the sun paint the clouds and Ballona Creek a deep red-orange at sunset. The wetlands area at the mouth of Ballona Creek are designated the Ballona Wetlands Ecological Reserve. for shorebirds, pelicans, egrets and herons. Images can be seen in the Bolsa Chica Wildlife section. 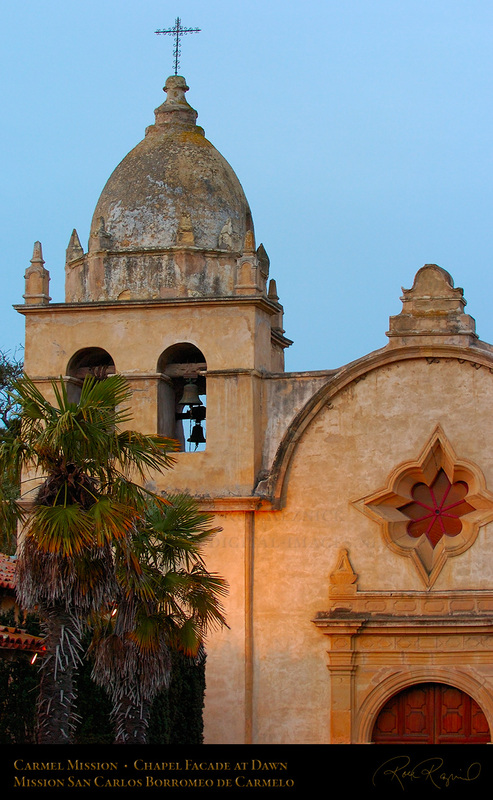 is the only one of the California Missions which still has its original bell-tower dome. Charles Borromeo, Archbishop of Milan (later St. Charles, see San Carlos al Corso). at the time, and Fages was eventually removed from his office as Governor in 1774.
standing next to the restored Padre’s Quarters, which today houses artifacts from the early Mission days at Carmel. 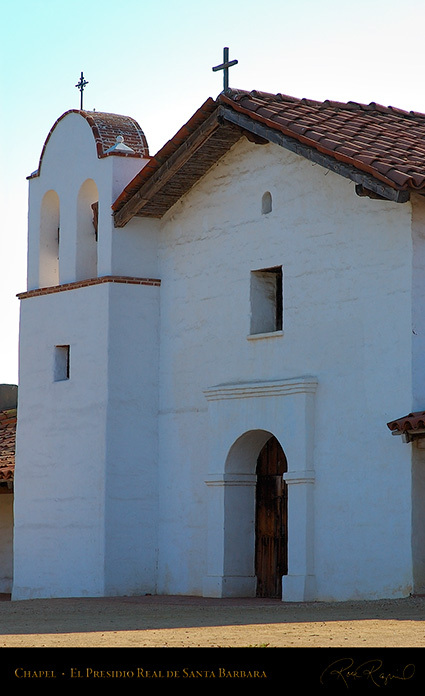 18 mission churches were built of adobe. In 1821 Mexico gained independence from Spain and took over the Mission. 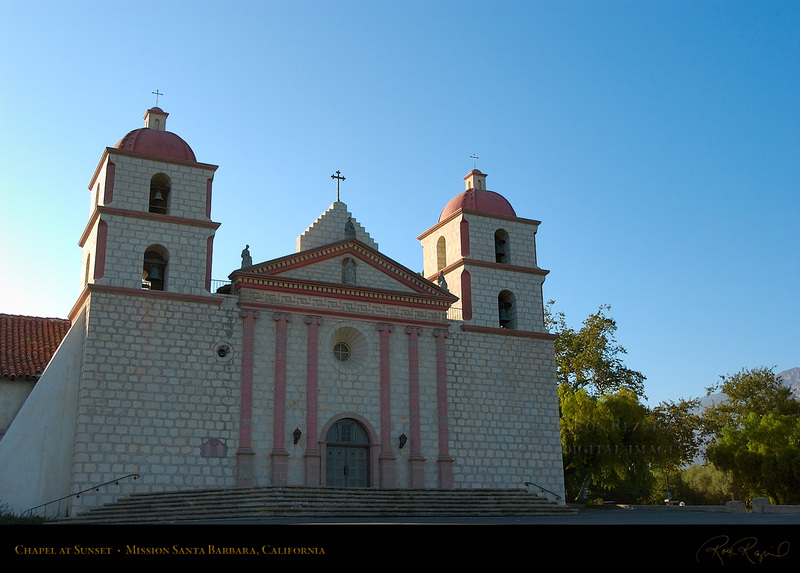 In 1834 they closed the Mission, took over the land, and sold much of it to new settlers. The mission decayed to ruins. research, the Carmel Mission Church is one of the most authentically restored of all mission churches. 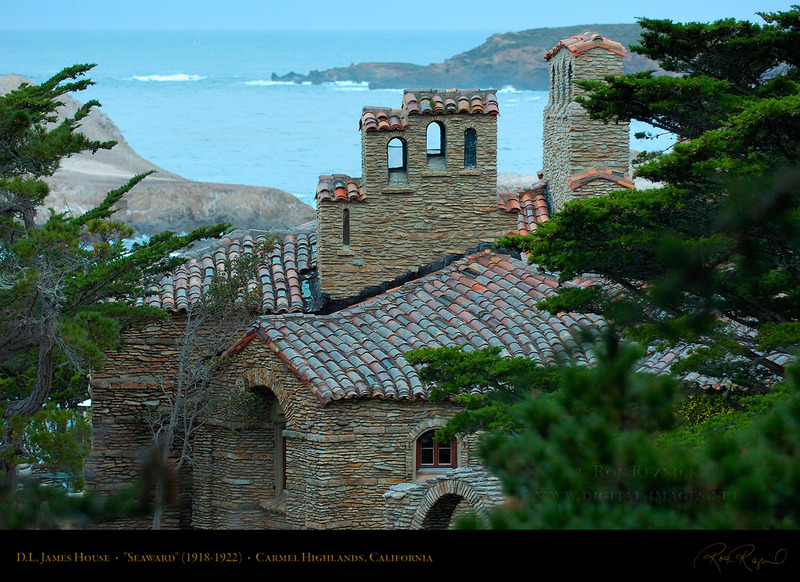 Seaward, the D. L. James Craftsman House in Carmel Highlands, designed by architect Charles Greene. 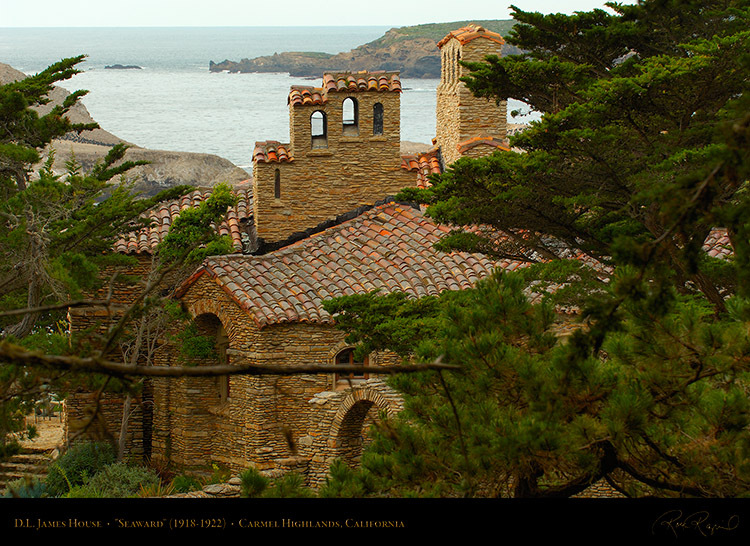 from nearby Yankee Point, and was inspired by the ruins of Tintagel Castle, a 13th c.
reflect a Mediterranean influence. Doors and windows were made from “Siam” teak. as viewed through the native pines just west of the Pacific Coast Highway (Highway 1) south of Carmel. 1936. 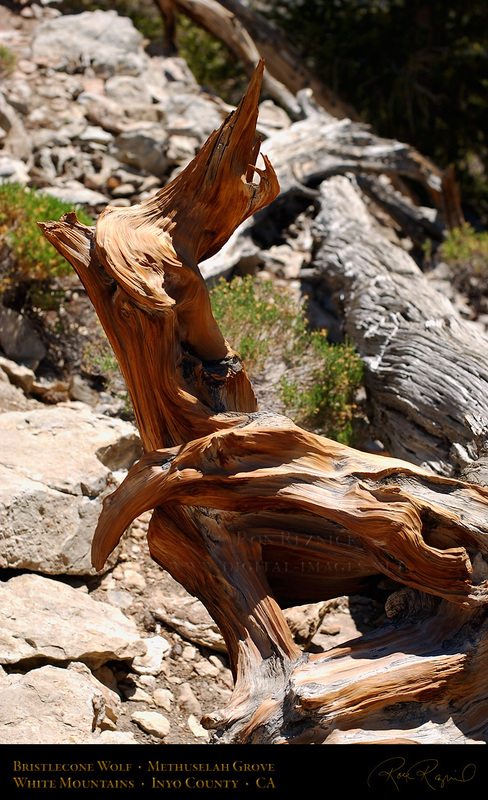 Due to slow work by carvers it was not completed until the 1950s, after D. L. James death. 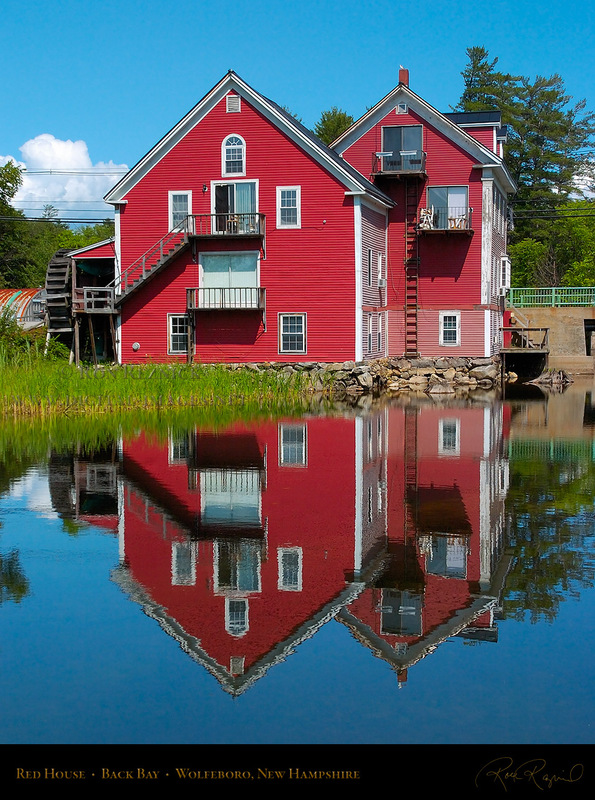 A distinctive red house on the Back Bay in Wolfeboro, New Hampshire. 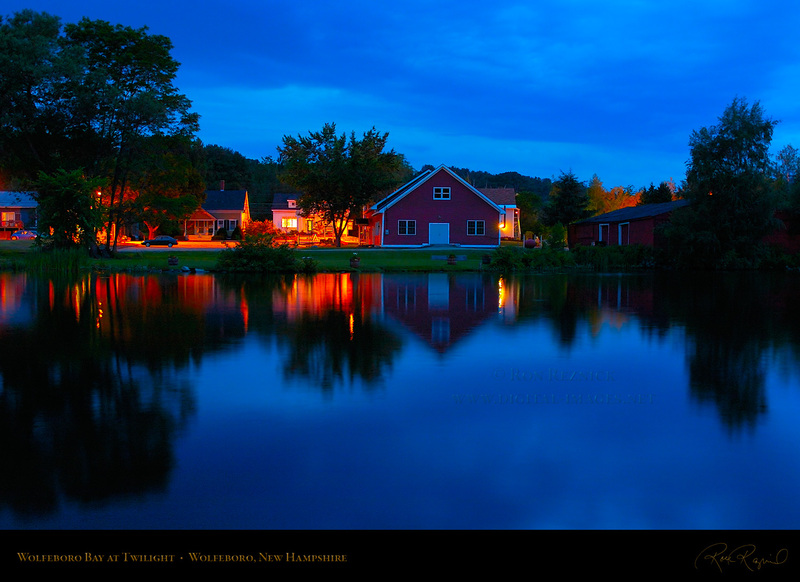 Homes along Wolfeboro Bay glow beneath a darkening sky in the waning twilight. 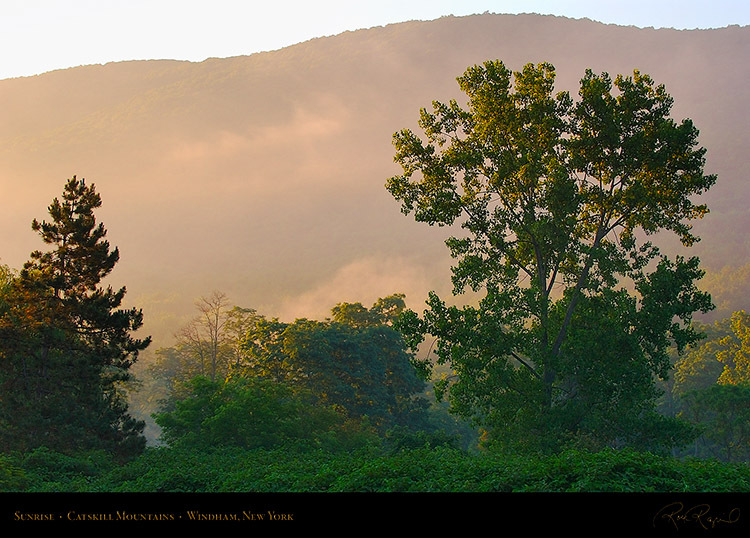 Sunrise cuts through the fog in the Catskill Mountains of New York. occurred in 1969 and brought 500,000 people to the area for the 3-day concert. 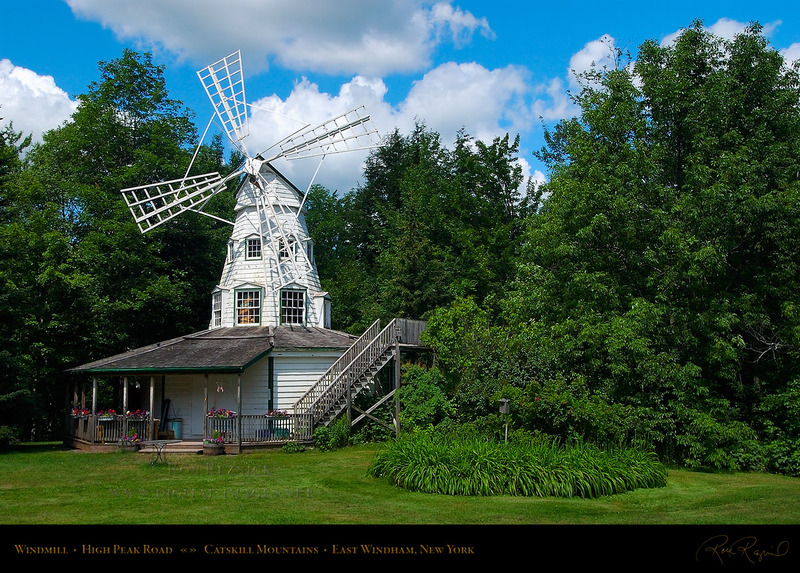 A quaint little windmill off High Peak Road near Silver Lake in East Windham, New York. The windmill is just across High Peak Road from the covered bridge at the southwestern end of Silver Lake. 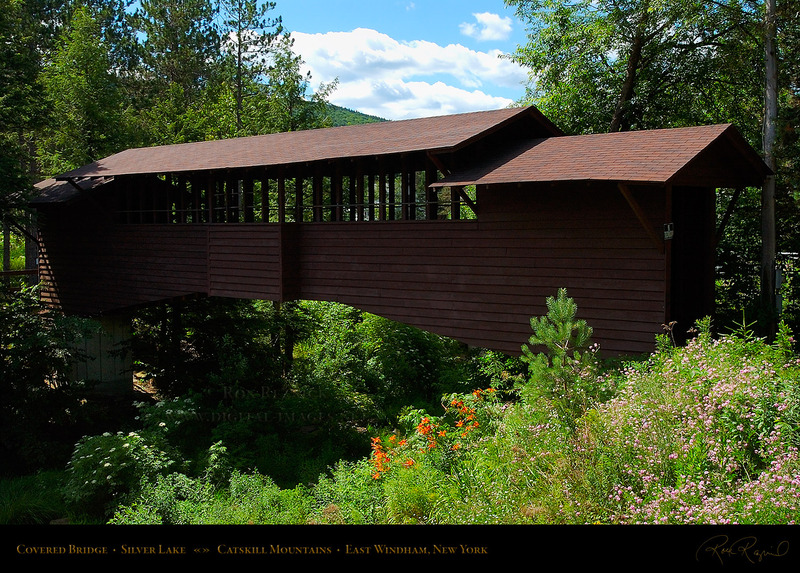 The covered bridge over the southwestern end of Silver Lake, in the Catskills near East Windham, New York. There are more than 200 covered bridges in New York. Most were built during the horse and buggy days between 1825 and 1912. 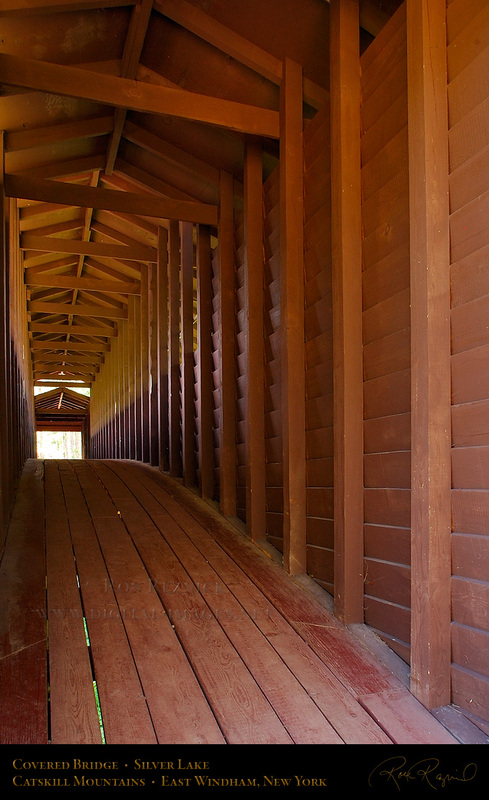 In the early days, bridges were made of wood to take advantage of local materials and labor and due to the speed of construction, and they were covered to protect the interior supporting timbers from moisture. This covered bridge over the southwestern end of Silver Lake is arched and supported from below, suspended between two piers. 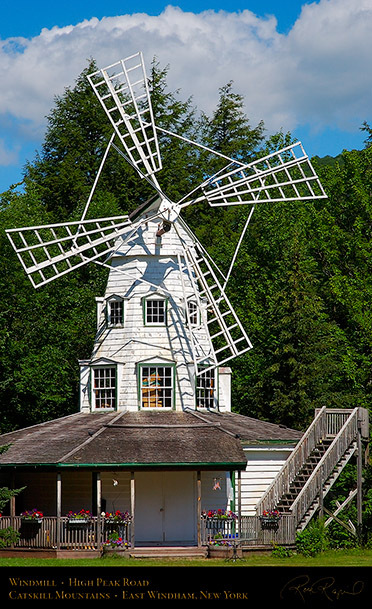 Wider crossings required multiple spans and/or complex truss systems, and in the 1800s there were several patents given for revolutionary truss designs, culminating in William Howe’s 1840 design that lightened the weight of trusses and was later used in railroad bridges. 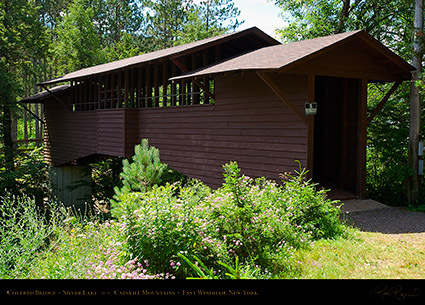 The Howe trusses were pre-assembled at a remote location, then loaded onto flatcars for final construction at the building site, and were an early example of pre-fabrication. Kaaterskill Creek, in Kaaterskill Clove, a deep gorge in the eastern Catskills west of Palenville. 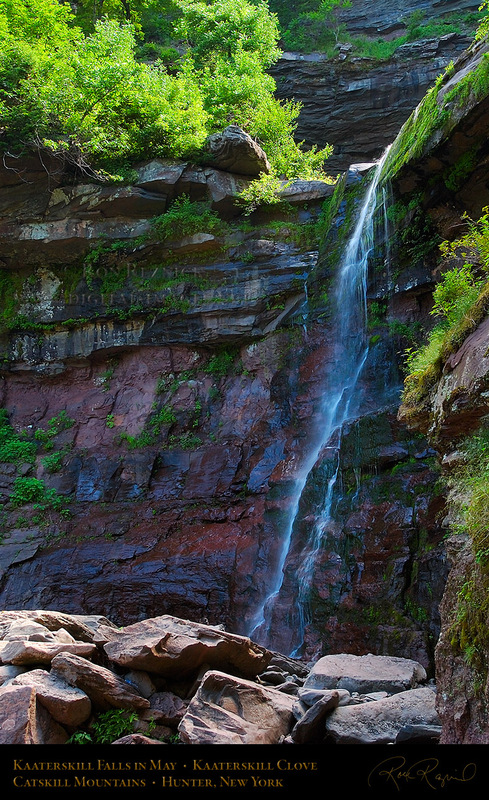 of Henry Hudson’s crew, and that Rip had slept for 20 years. Irving’s story was published in 1819. 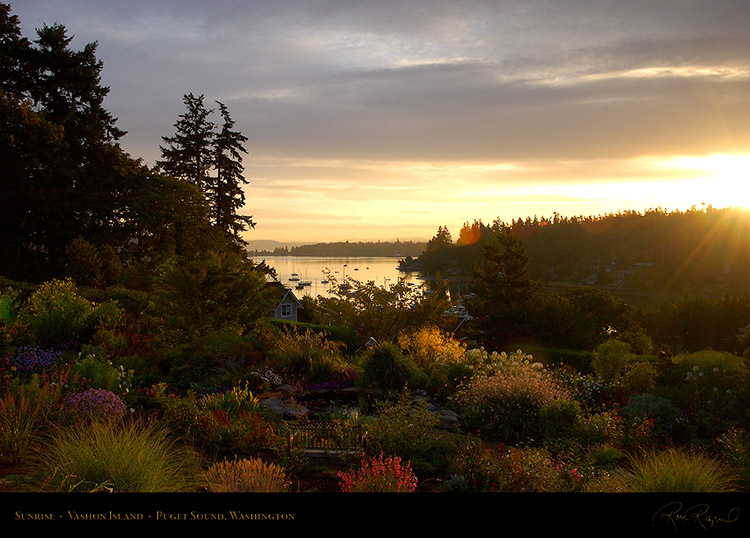 American landscape painting. 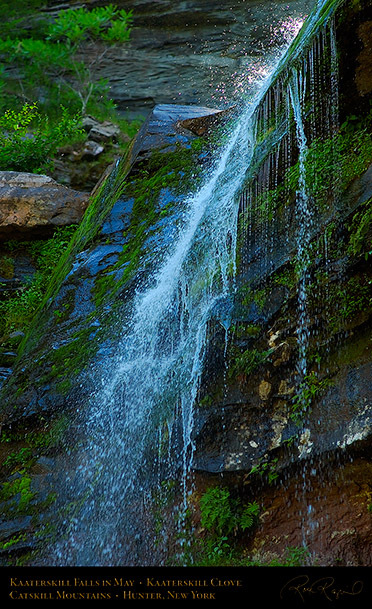 These images were taken in mid-July, when the flow is reduced. Kaaterskill Falls is New York’s highest and one of the highest in the Eastern United States. twenty year nap resulting from his drinking the liquor from his bearded companions’ keg. 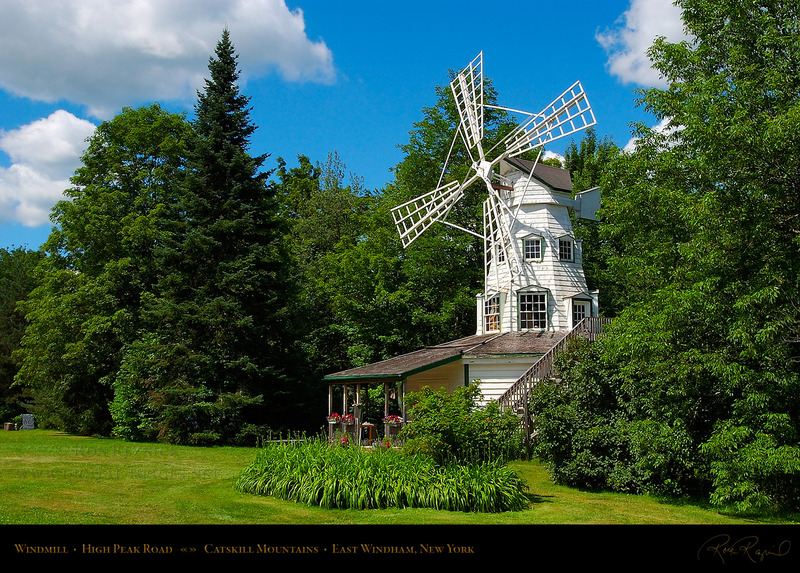 famous in the 1819 Washington Irving story of Rip van Winkle. Palenville was famous for sweeping views of the Hudson River Valley. 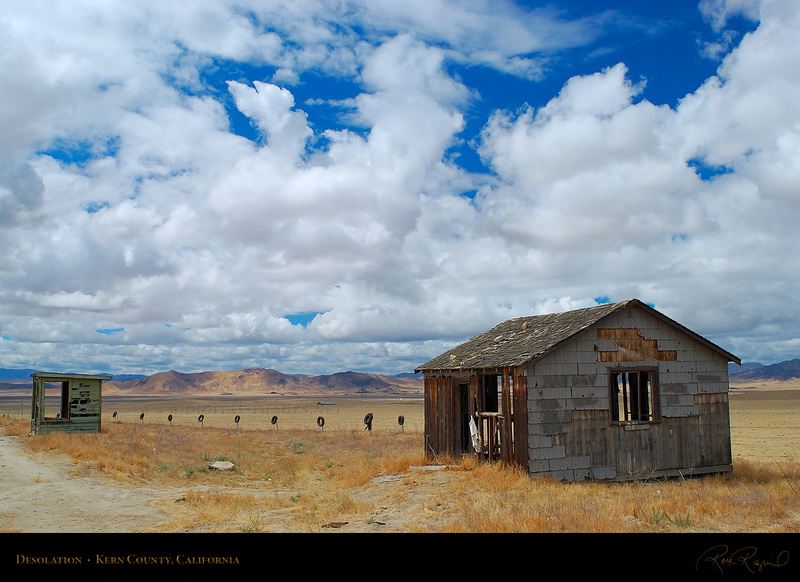 I encountered a weathered shack which summed up the desolate feeling of that part of Kern County. A farm maid statue in a small shopping plaza and the Old Mill Loft Windmill in Solvang, California. 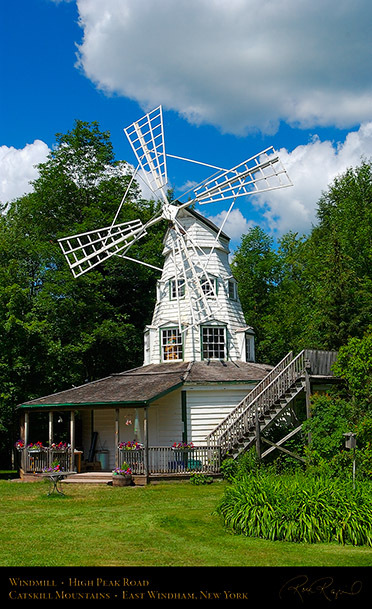 with Danish and other European antiques and collectibles, arts and crafts, food, pastries, wines, etc. 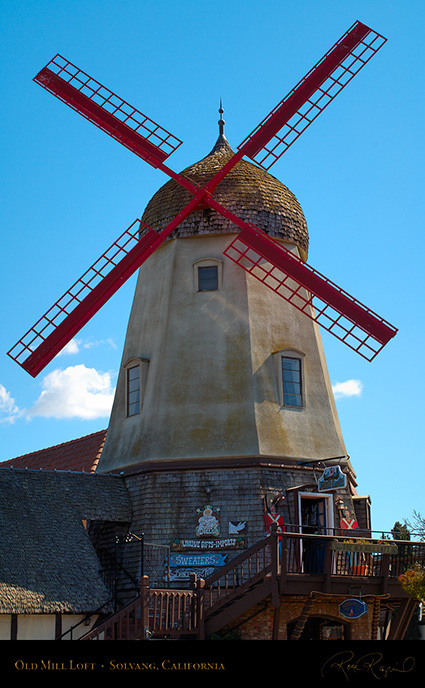 center of town, a museum dedicated to Hans Christian Andersen, and many other attractions. 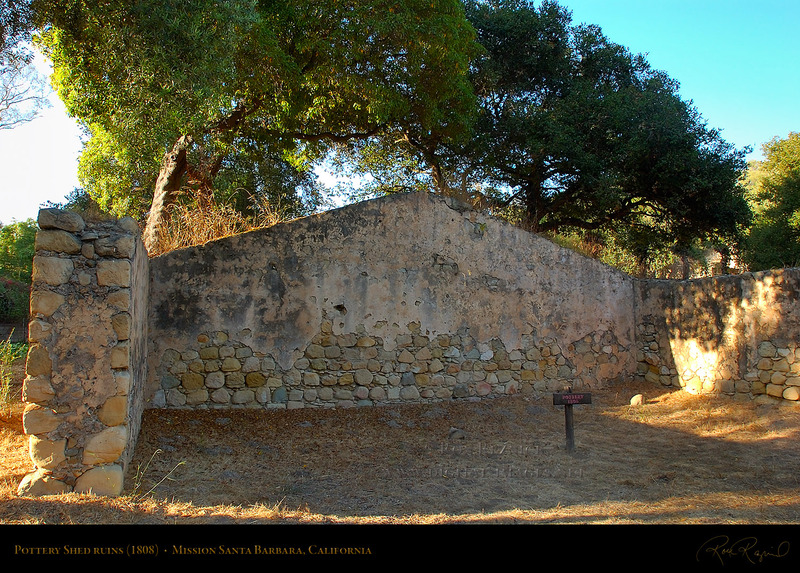 The guard tower over the soldiers quarters at the northeast corner of the Santa Barbara Presidio. 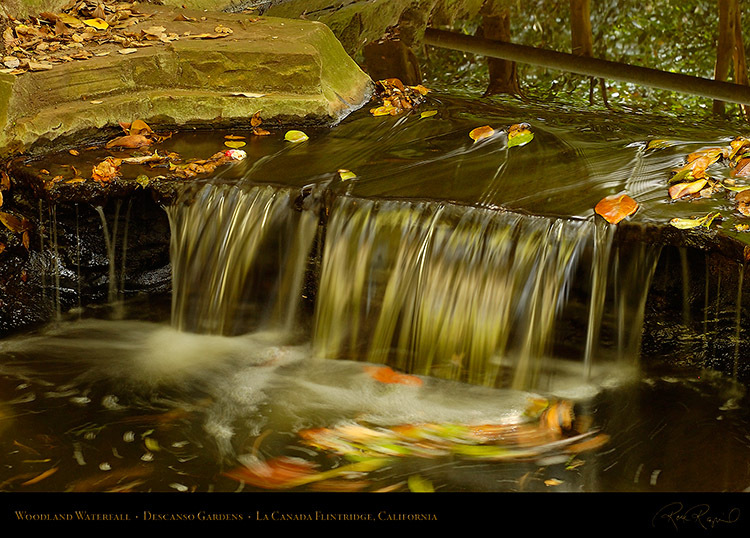 to defend the Second Military District in California (from the Old Pueblo of Los Angeles north to Lompoc). 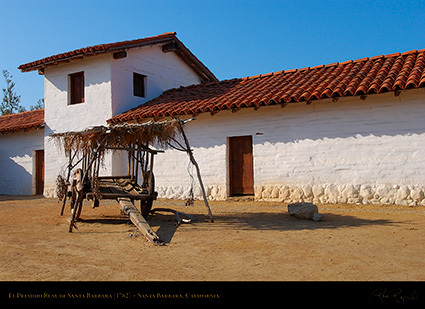 The whitewashed buildings were made of sun-dried adobe bricks laid atop a sandstone boulder foundation. inactive. 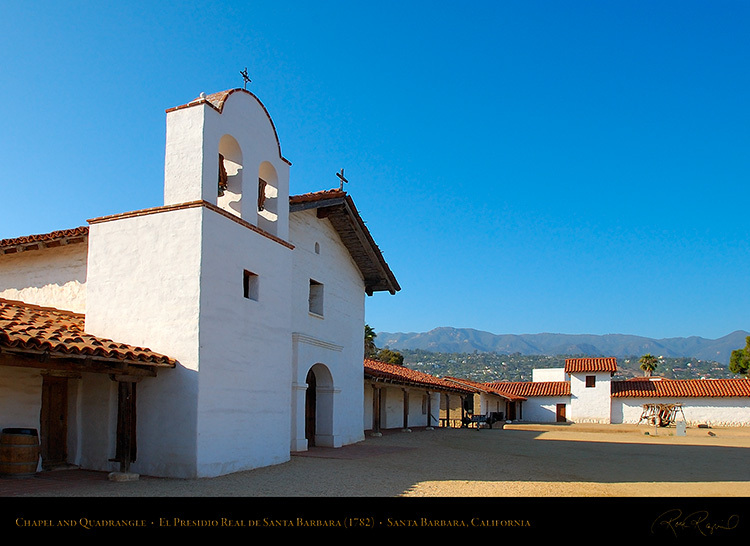 El Cuartel is California’s second oldest structure after the Chapel at San Juan Capistrano. and the guard tower. 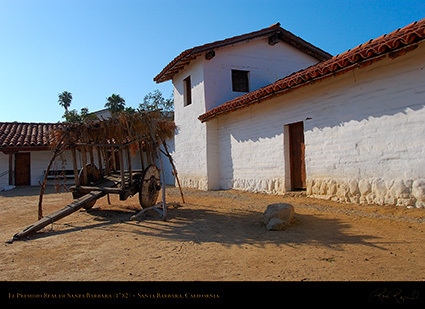 Reconstructions were done with adobe bricks as used in original structures. 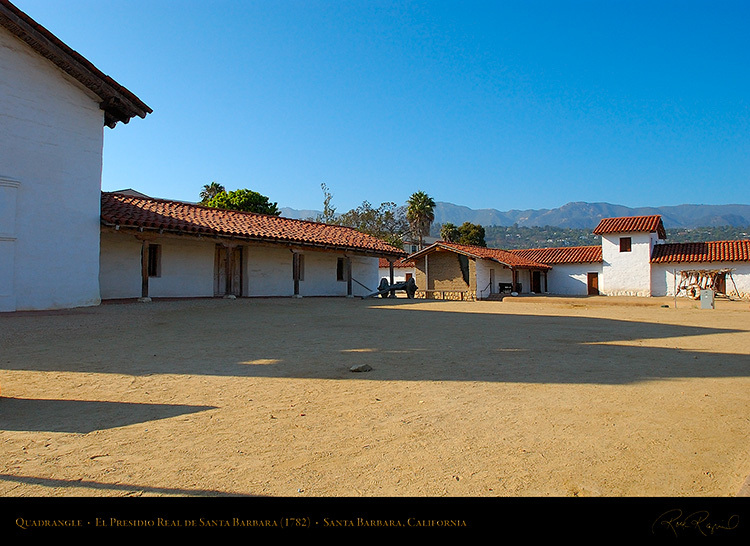 and the Lieutenant’s and soldiers quarters with their guard tower at El Presidio de Santa Barbara. The reconstructed Santa Barbara Presidio Chapel facade. 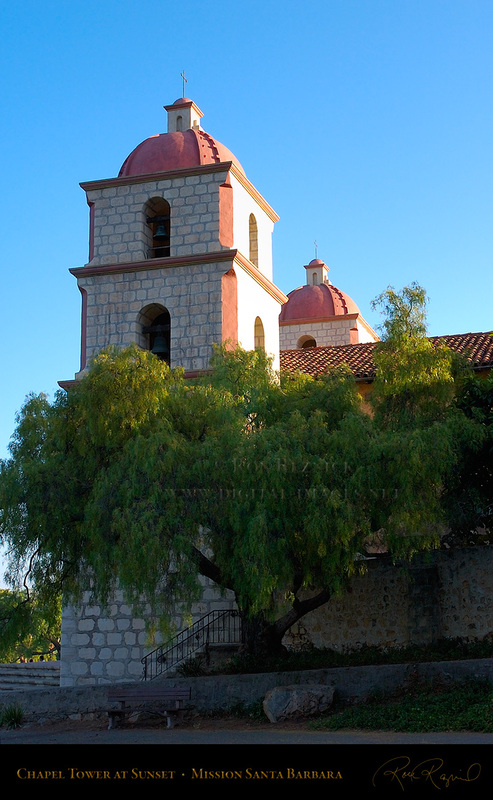 The north bell tower of the Santa Barbara Mission Chapel. 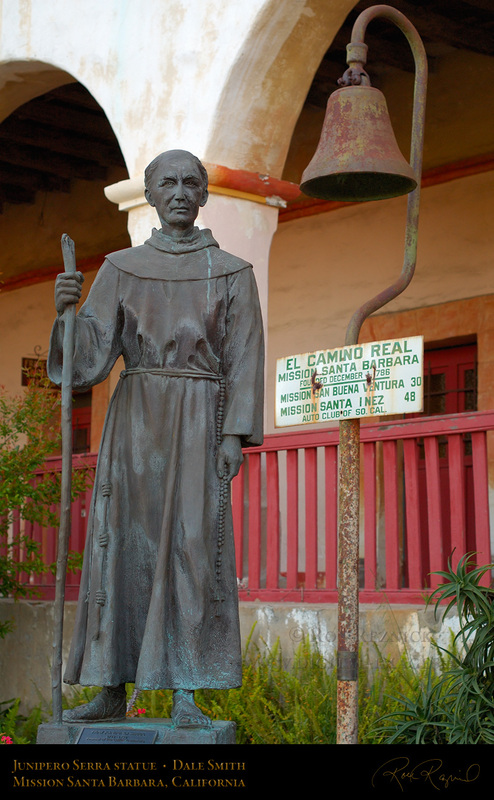 The statue of Junipero Serra and original Camino Real Bell. 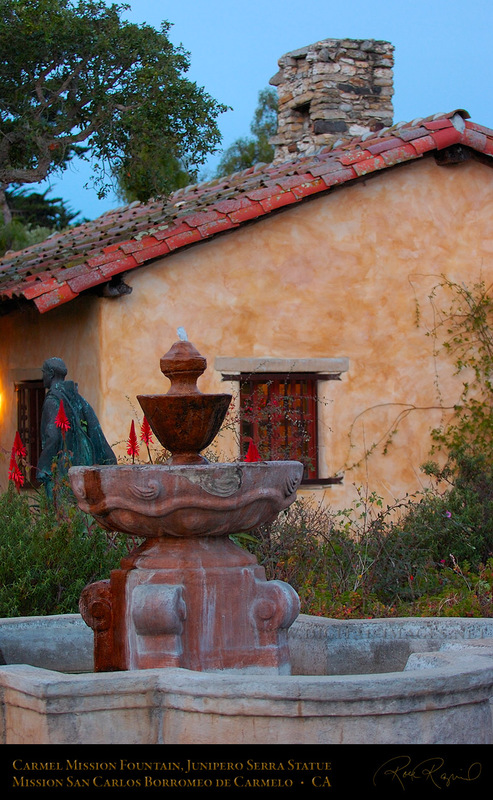 This is one of 100 life-size statues erected by William Hannon in various places important in the life of Junipero Serra. 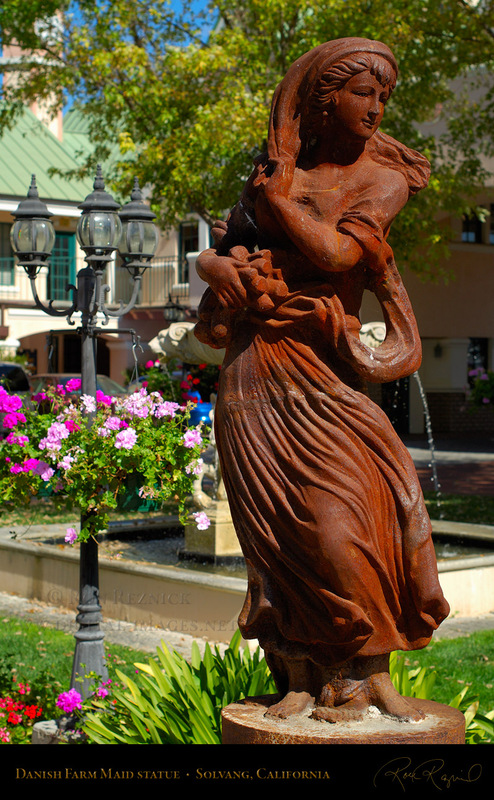 The bronze statues were sculpted by Dale Smith and fabricated at the Studio America Foundry in Oroville in the 1990s. The south bell tower of the Santa Barbara Mission Chapel. 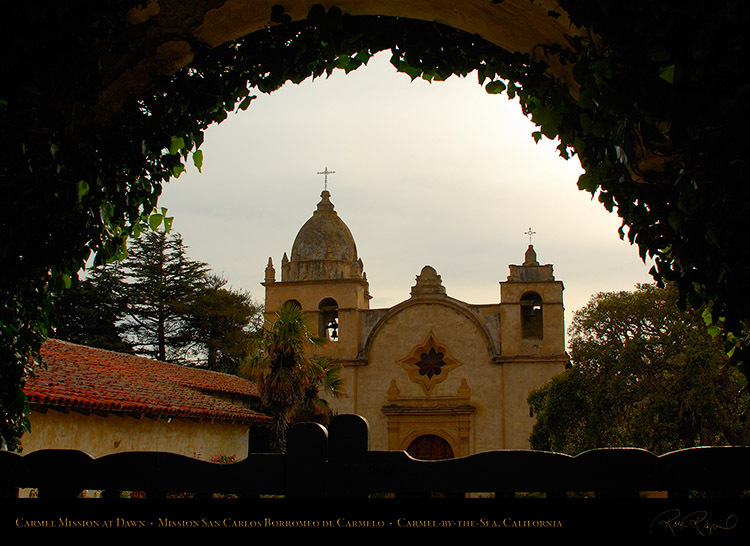 The chapel was the fourth built by the early missionaries. The earlier three were built progressively larger of adobe, but after the 1812 earthquake destroyed the existing buildings the new chapel was rebuilt in stone and completed in 1820.
the pediment represent Faith, Hope and Charity. 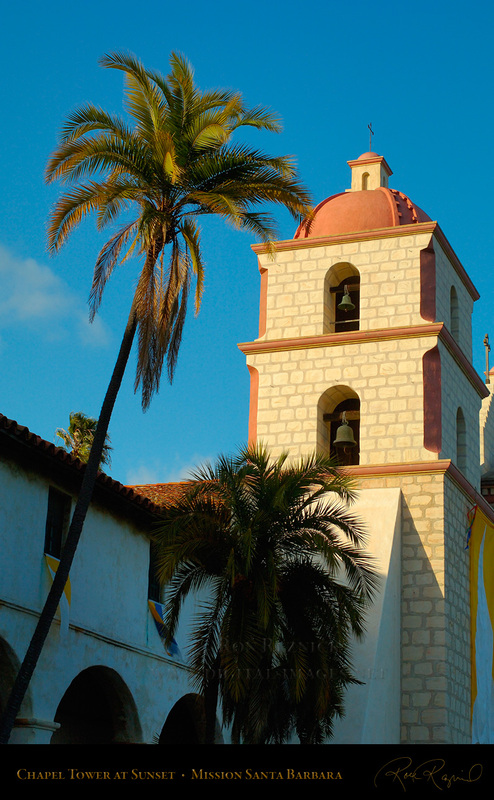 The niche statue of Santa Barbara was added in 1927.
only three Missions with stone churches (others are at Carmel Mission and San Juan Capistrano). The remains of the 1808 Pottery Shed in Mission Park to the north of the Mission grounds. A 1908 REO Model B Runabout on the streets of Pasadena, California. The peaked extension of the hood above the radiator identifies this REO as a 1908. The REO Model B Runabout had two individual front seats and a folding rear seat known as the mother-in-law seat. The buggy top did not extend to cover the rear seat, leaving the mother-in-law in the rain. The 106 cubic inch single-cylinder 8 hp water-cooled horizontal side-cranked engine had a single camshaft driven by spur-gears. It powered a planetary two-speed drum transmission, and used a new style of clutch with four bronze discs rather than the earlier, single leather-faced disc. The REO Runabout would “run about” 30 miles per hour comfortably. The REO Runabout used a wheel for steering rather than the tiller used on the earlier Curved Dash Oldsmobile Runabout. The contemporary Oldsmobile Touring Runabout cost $100 more, which made the REO popular among the buying public. 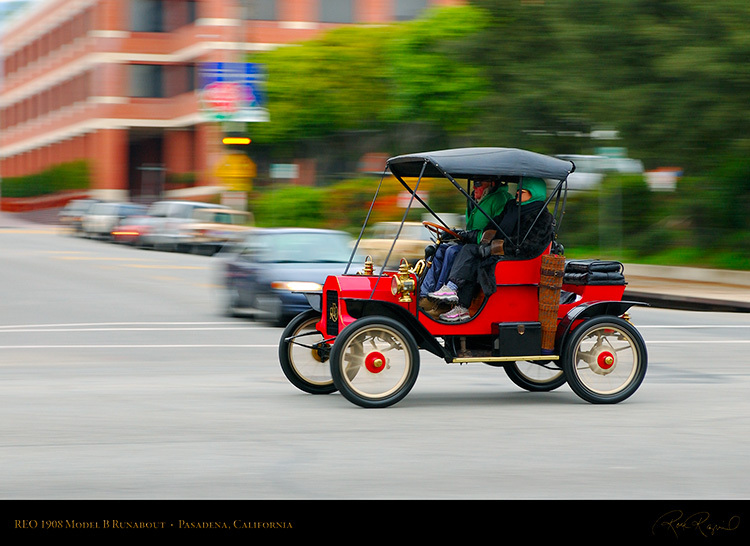 By 1908, its 4th year of production, REO was America’s third largest in sales after Ford and Buick. the first automobile that was mass-produced and built on an assembly line. This was the best-selling car in America by 1902. In 1904 Olds left the company he founded due to disagreements about company control and created the R. E. Olds Motor Car Company (changed to REO to avoid a threatened lawsuit). REO did quite well, but the Olds Motor Works would have failed if it had not been bought by William Durant and absorbed into General Motors in 1908. 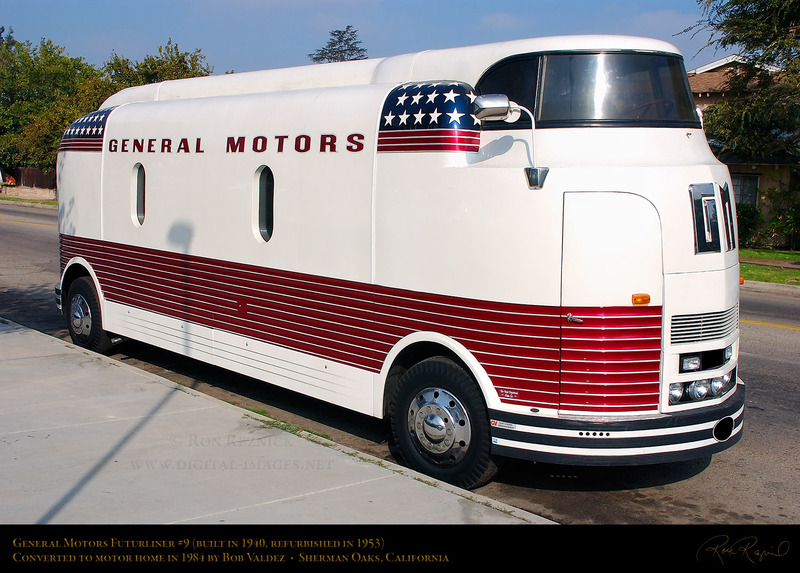 A 1953 GM Futurliner, converted to an Art Deco motor home by Bob Valdez of Sherman Oaks. 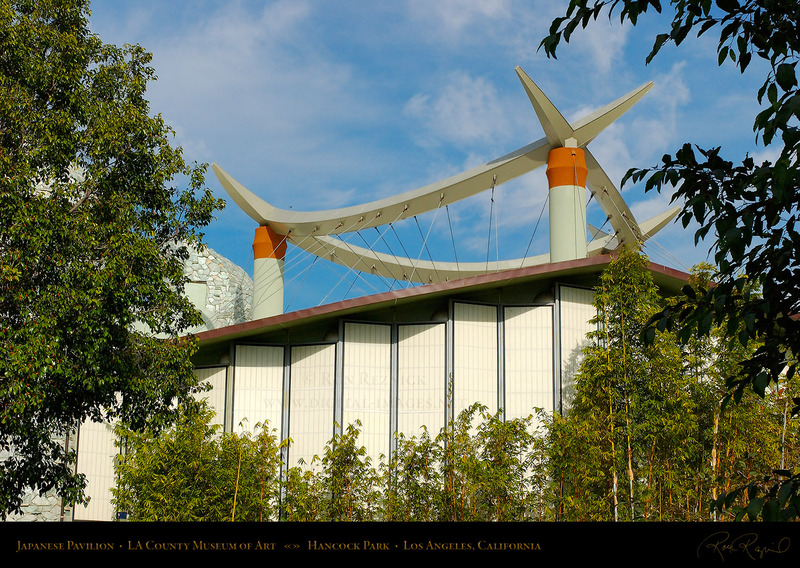 built in 1940 to replace eight 1935 Streamliners, designed for the first Parade of Progress in 1936.
were refurbished in 1953 and used from 1953 to 1956, when Parades ended due to television. were used to transport and display dioramas and exhibits like microwaves and television. and walk to the rear to manually select one of three gears for a total of 24 gear combinations. of the bus to illuminate the entire area around it (powered by a 200 KW diesel generator). The Parade of Progress was cancelled in 1956 due to lack of attendance caused by the advent of television, one of the innovations that the Futurliners displayed along with jet engines and microwaves. It was determined that the Futurliners would no longer be needed, and nine were sold. Two were donated to the Michigan Police, who repainted them in their colors and called them Safetyliners, using them as a traveling display to promote safety and law enforcement until 1967. One Futurliner was bought by Oral Roberts, renamed the Cathedral Cruiser and used on evangelical tours. Peter Pan Bus Lines of Springfield Massachusetts has two Futurliners, and Fido the Canadian Futurliner was originally one of the two Safetyliners (number 11). This unit sold at auction in 2006 for a record $4,320,000. Futurliner #8 found its way to Sweden and will be restored (it is the only Futurliner in Europe). Futurliner #10 is in the National Automotive and Truck Museum (NATMUS) in Auburn Indiana. 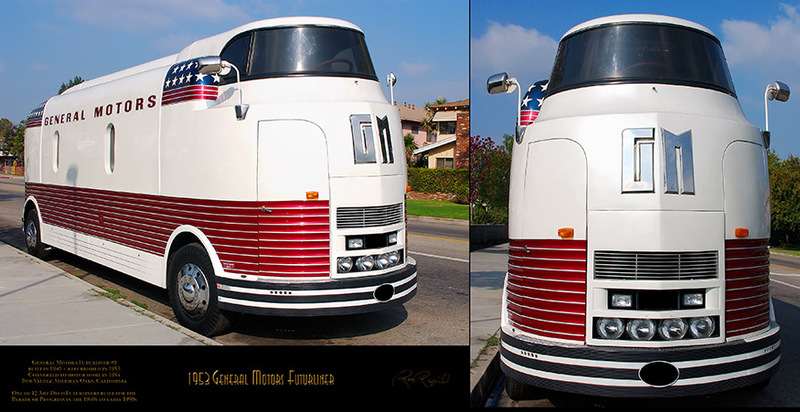 Futurliner #3, the Allison Jet display, was restored to original condition (completed late 2014). 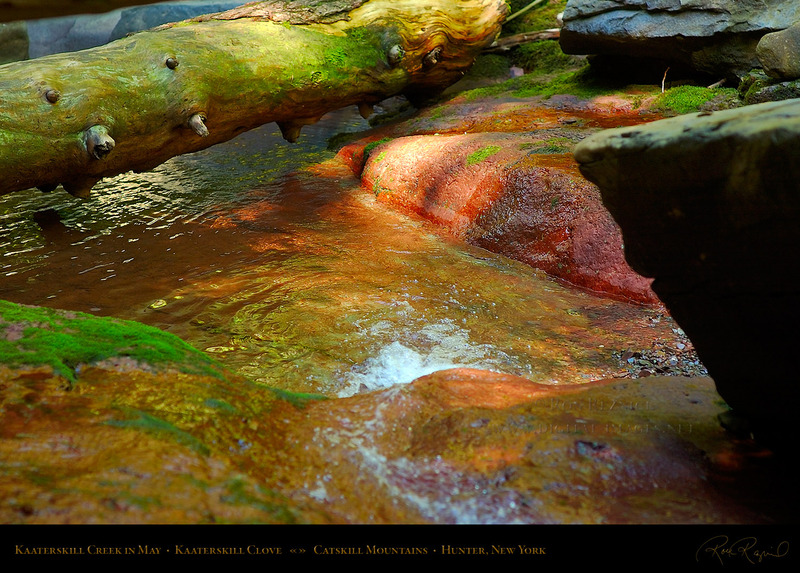 and has been featured in a number of publications. Bob did most of the restoration himself. The interior features leather and chrome, and a curved gray and maroon velvet rear seat. More antique cars and examples of automotive art are in the Concours d’Elegance section. 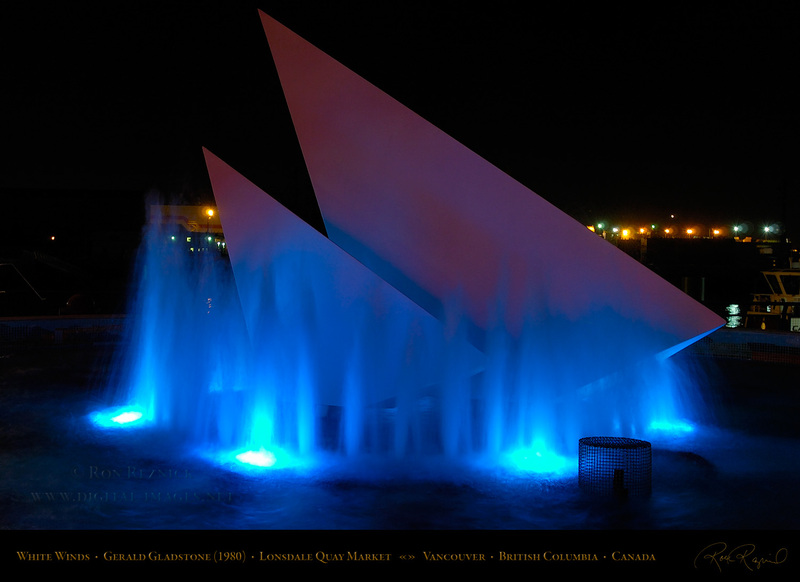 White Winds (1980), created by Gerald Gladstone in Lonsdale Quay Plaza, Vancouver, BC, Canada. The image above left was taken just as the magenta lights faded to blue (this required several attempts). 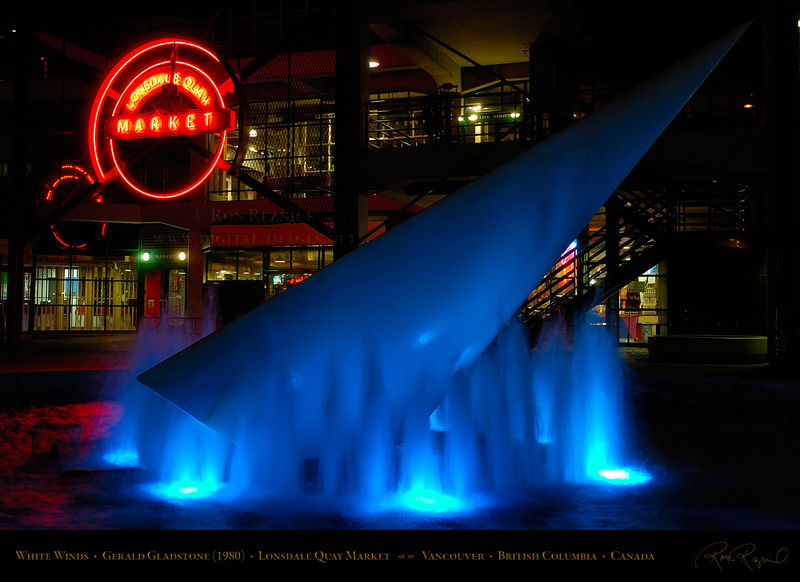 in Lonsdale Quay Plaza, Vancouver, BC, Canada. White Winds is intended to represent sails leaning into the wind. Canadian cities and sculptural pieces in public and private collections. 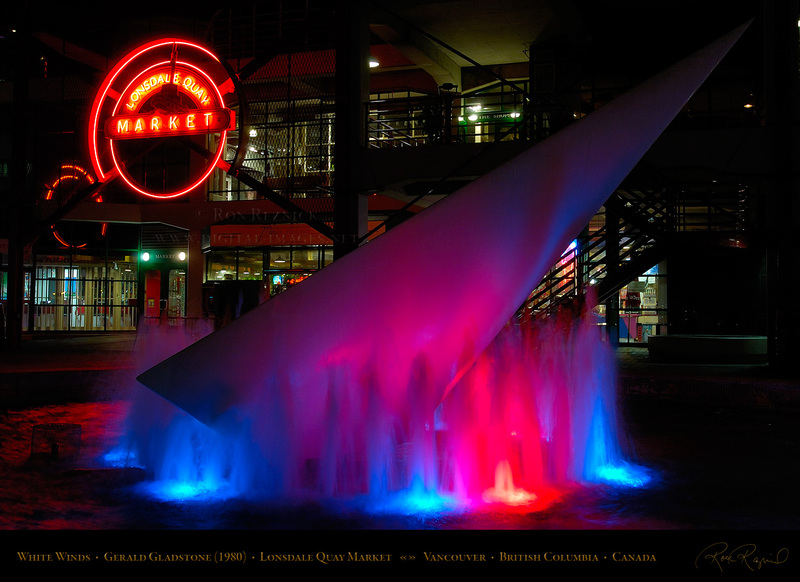 At night, the sculpture is lit by a succession of magenta, red, blue and white light. Capturing the light spectrum in the optimum order required a difficult timing shot. 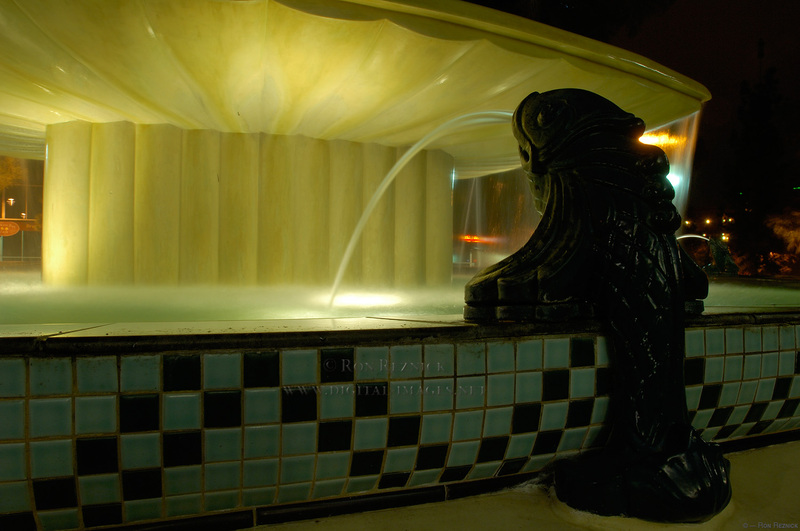 A low angle closeup of the fountain in front of Burbank City Hall. 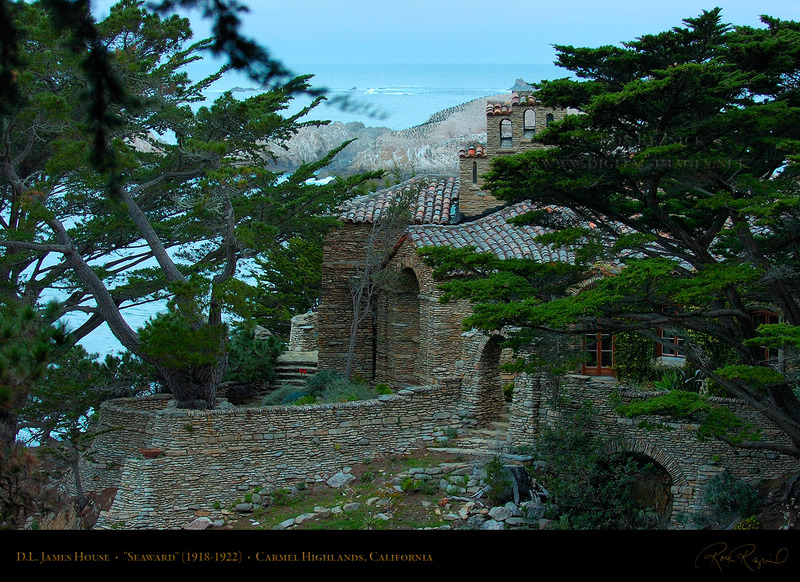 for years, spawning stories, a novel (Murder at San Simeon) and a Bogdanovitch film (Cat’s Meow). Marion Davies, causing a vendetta that caused Hearst to attempt to drive Bell out of business. in 1940, who created a lush paradise around a double-deck houseboat on the lake. reproduction of a 16th century Dutch windmill. 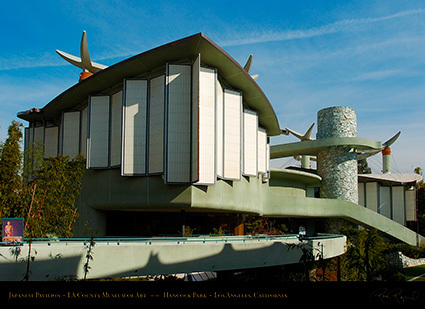 Both structures remain today. 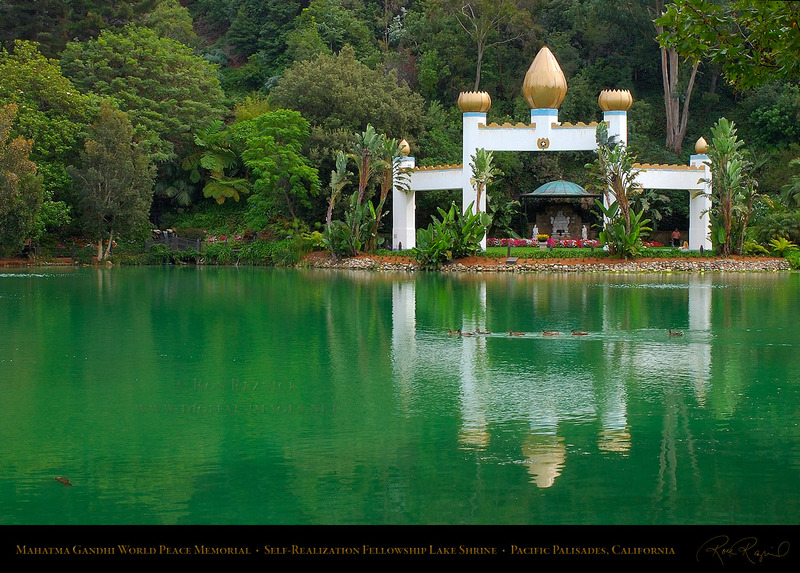 sent to Lake Shrine founder Paramahansa Yogananda not long after Gandhi’s death in 1948. 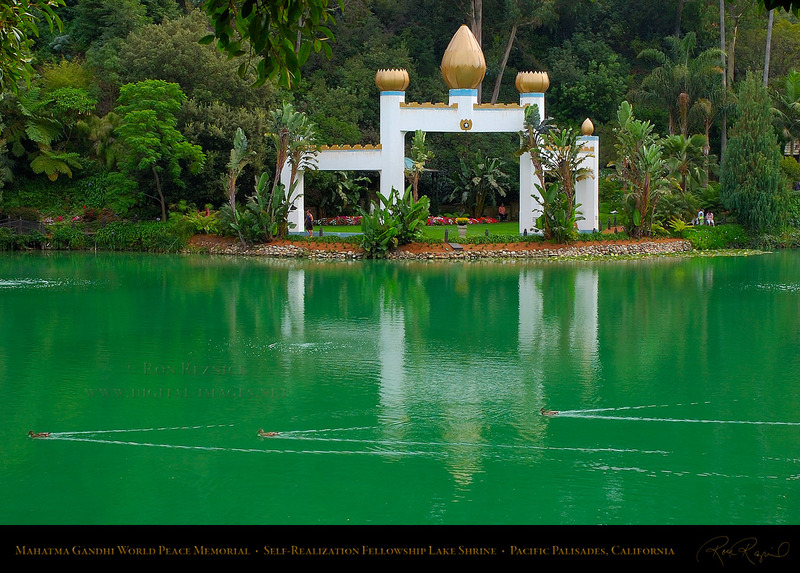 The sarcophagus in the golden Lotus-topped memorial is flanked by two statues of Guanyin. Paramahansa Yogananda founded the Self-Realization Fellowship Lake Shrine in 1950. A small woodland waterfall in the Camellia Forest of Descanso Gardens in La Canada/Flintridge. 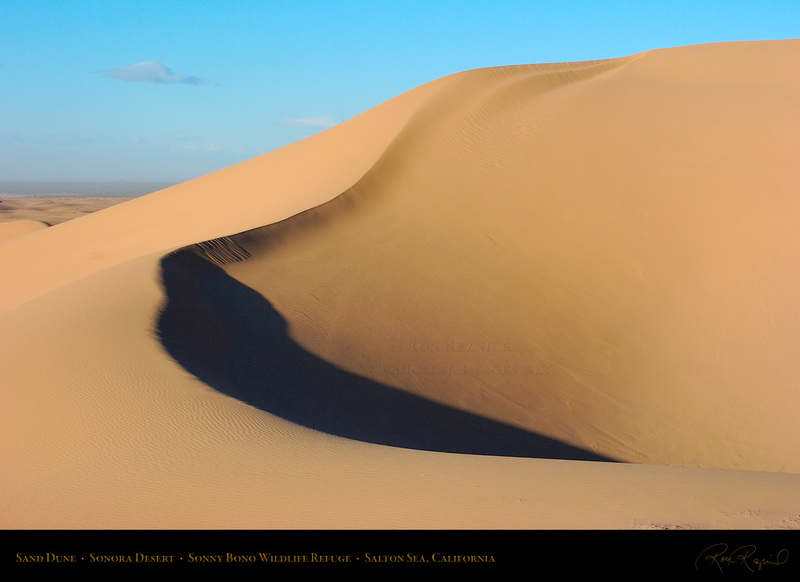 A sweeping sand dune in the Sonora Desert at the Sonny Bono National Wildlife Refuge, Salton Sea, CA. the entire volume of the Colorado into the Salton Sink. Lack of drainage created the Salton Sea. 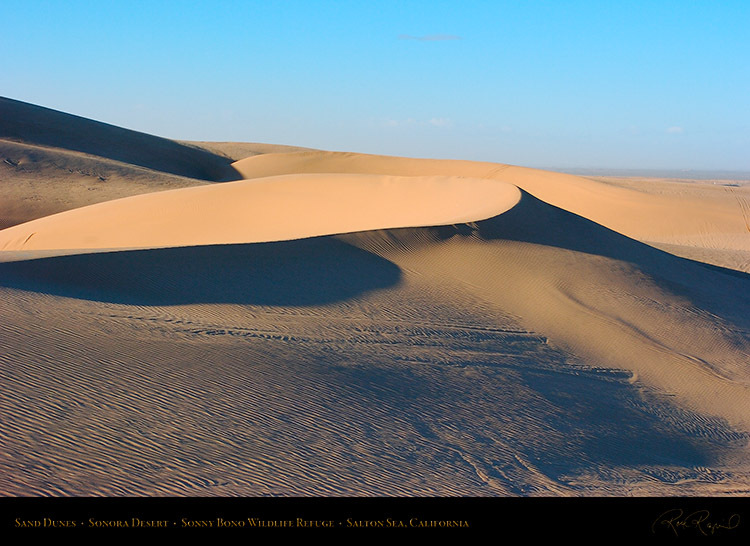 Sand dunes in the Sonora Desert at the Sonny Bono National Wildlife Refuge, Salton Sea, CA. 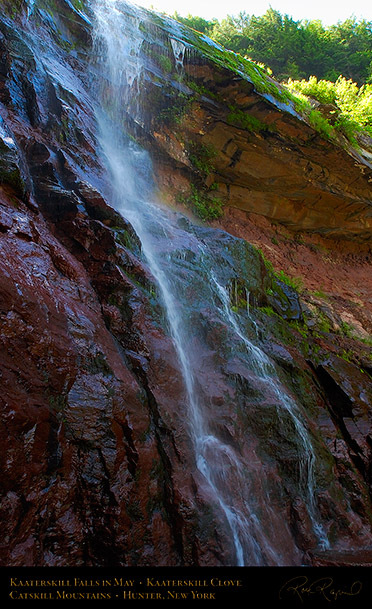 major proponent of these efforts when he was a Congressman, and the Refuge was named for him. 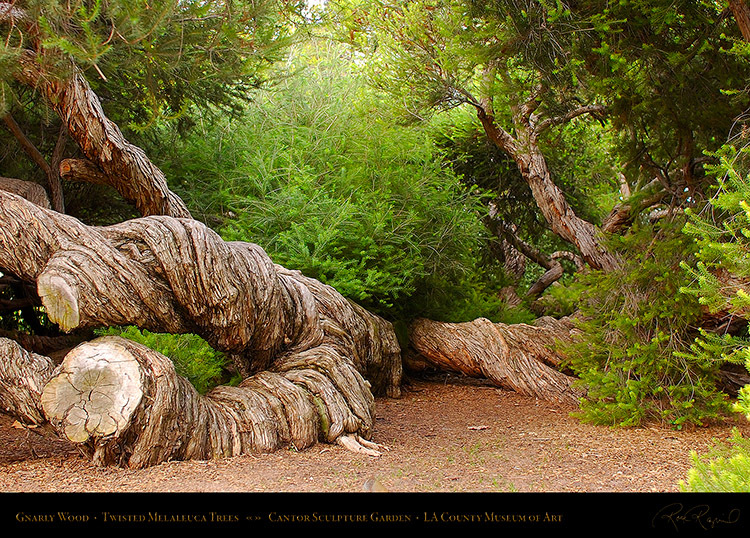 Gnarled and twisted Melaleuca Trees in the Cantor Sculpture Garden outside the LA County Museum of Art. A life-size fiberglass female Columbian Mammoth sinking in the tar at the LA Tar Pits in Hancock Park. At the far left is an American Mastodon, in front of the Japanese Pavilion of the LA County Museum of Art. The LACMA Japanese Pavilion reflected in the water of the Lake Pit in Hancock Park. 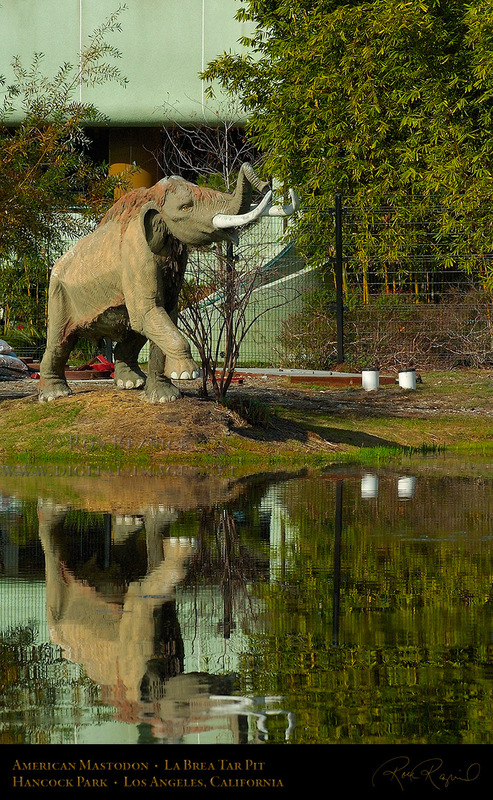 The lake pit is the remains of Henry Hancock’s asphalt mine at the Rancho La Brea Tar Pits. 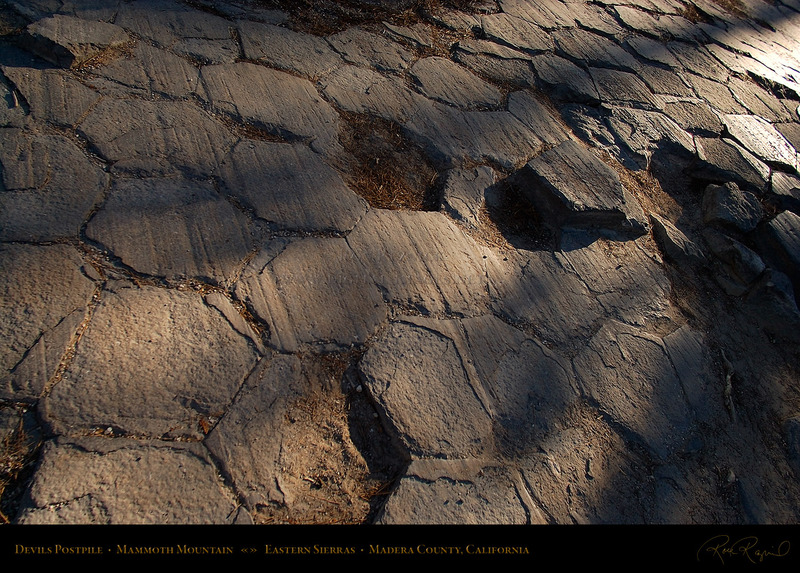 perfectly preserved bones, turned dark brown by the asphalt, have been excavated for 100 years. 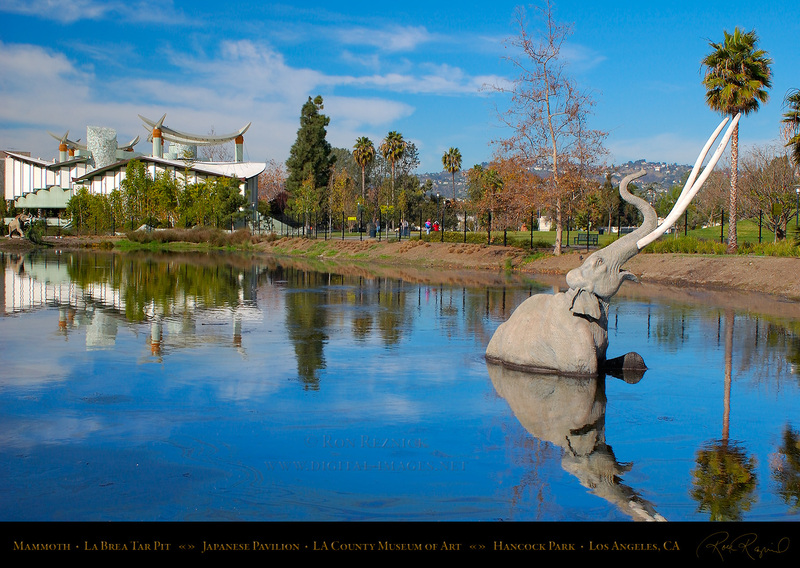 An American Mastodon and the LACMA Japanese Pavilion reflected in the Lake Pit in Hancock Park. 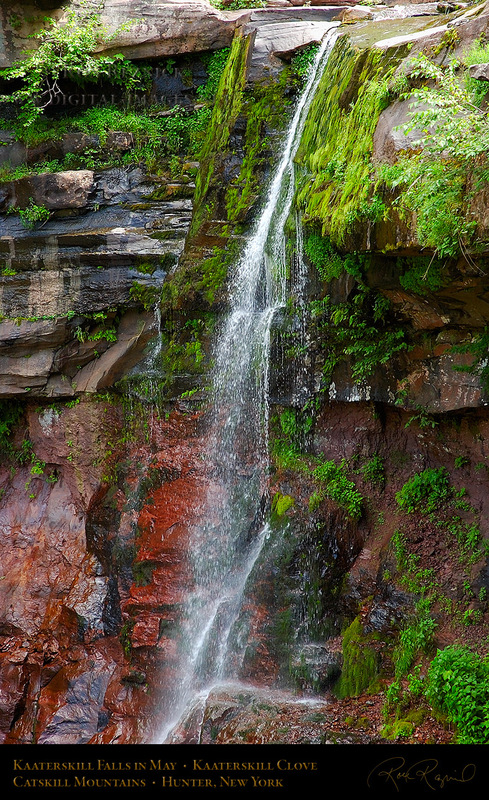 have yielded thousands of fossils from dozens of species: animals, birds, reptiles, amphibians and plants. 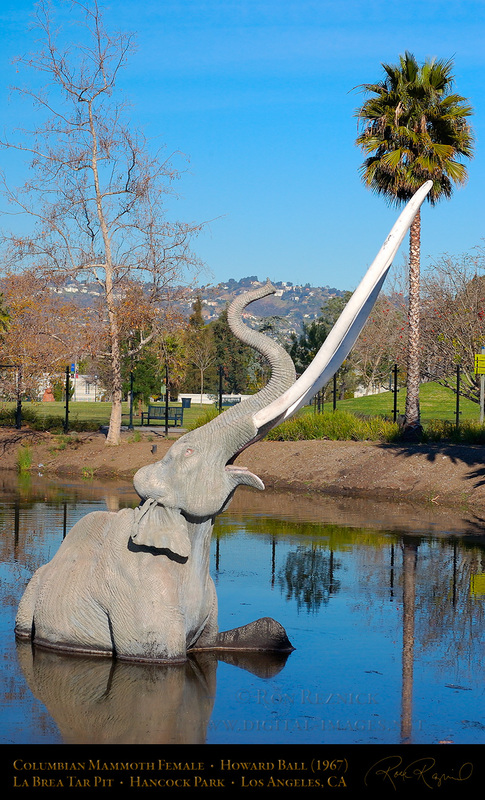 The fiberglass sculpture of a female Columbian Mammoth trapped in asphalt at the Lake Pit in Hancock Park. On the shore nearby are a baby and adult male Mammoth, watching helplessly as the female sinks into the tar. The sculptures were created between 1967-68 by Howard Ball and towed to Hancock Park behind a VW Bug. a minor sensation which made the covers of the Los Angeles Times newspaper and Life Magazine in 1967.
a 20 year old woman who was discovered in 1914, interred with a domestic dog about 10,000 years ago. 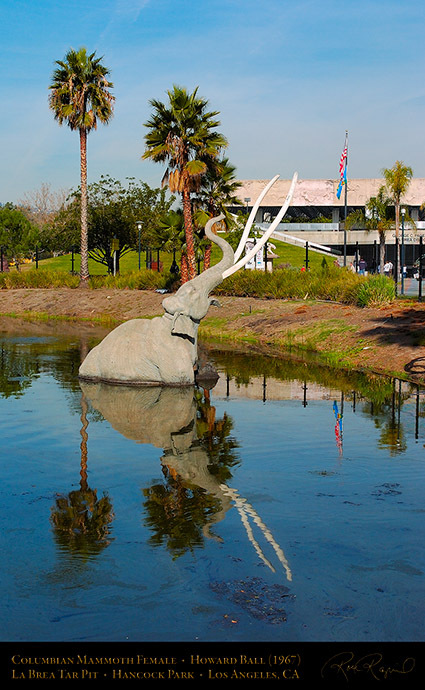 An American Mastodon sculpture standing at the edge of the largest La Brea Tar Pit, in front of the Japanese Pavilion of the LA County Museum of Art in Hancock Park. A detail shot of the American Mastodon sculpture is at right. The Hancock Park development was built around the La Brea Tar Pits in the 1920s by George A. Hancock using profits derived from oil drilling in the Rancho La Brea area. 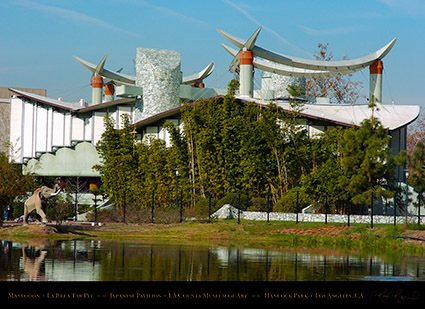 George Allan Hancock, who was born and raised in a home next to the tar pits, created a development of architecturally distinctive homes around the Wilshire Country Club. 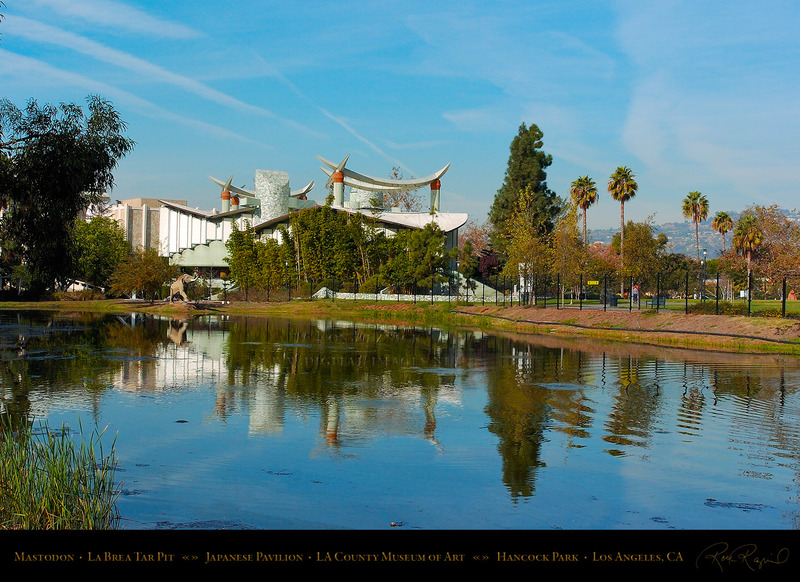 Besides the LA County Museum of Art and the La Brea Tar Pits, the park itself (within the development) is the site of the Page Museum, which displays fossils recovered from the archaeological site. 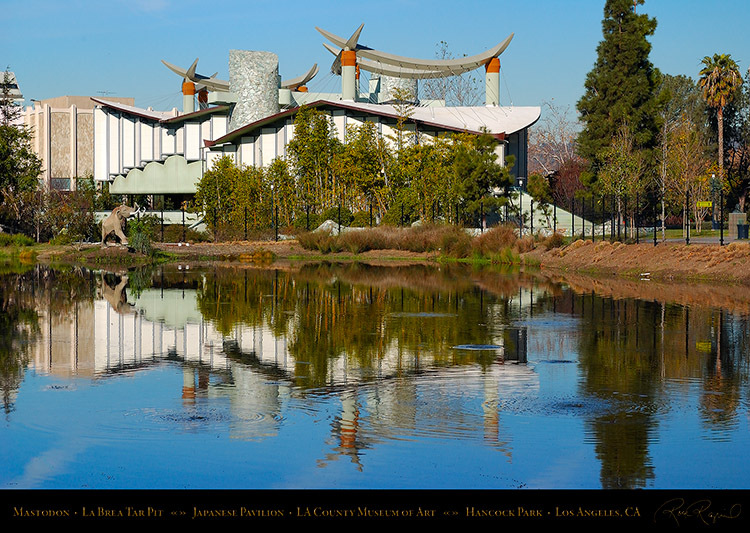 Two other views of the Japanese Pavilion at the LA County Museum of Art, designed by architect Bruce Goff. with $5 million to create a building to house them. The Japanese Pavilion was completed in 1988. 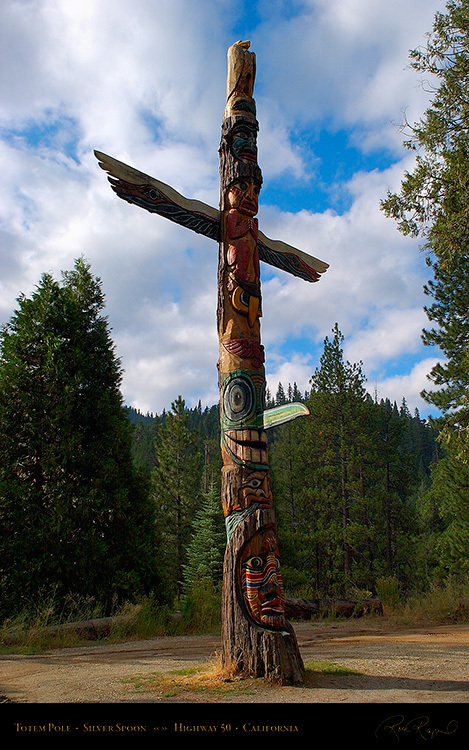 A Totem Pole off Highway 50 south of Lake Tahoe near the Silver Spoon Cafe. 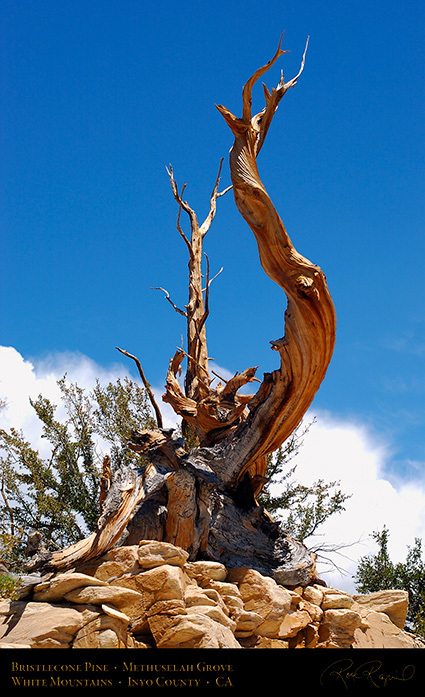 The trees of the Ancient Bristlecone Pine Forest in the White Mountains 15 miles east of Bishop are the oldest living things on earth. 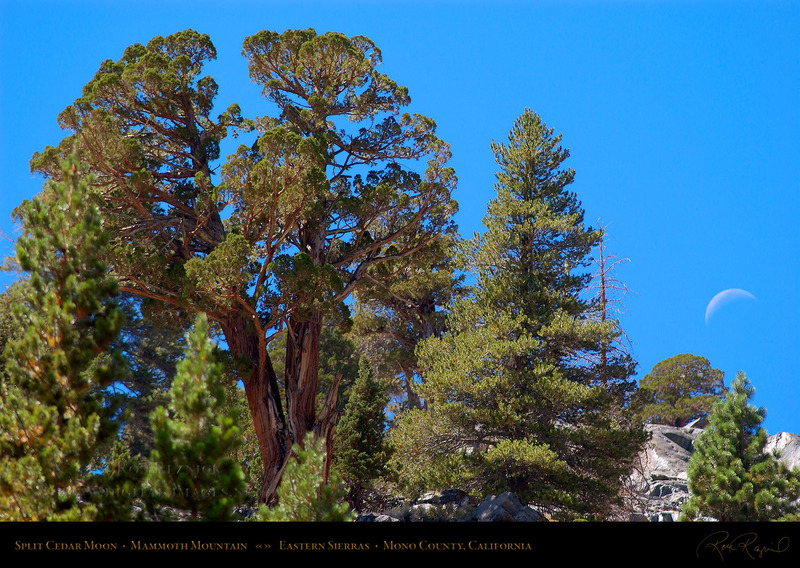 A millennium older than the Giant Sequoias in the nearby Sierras, many are well over 2,000 years old and the Methuselah tree in Schulman Grove is dated at more than 4,846 years old. 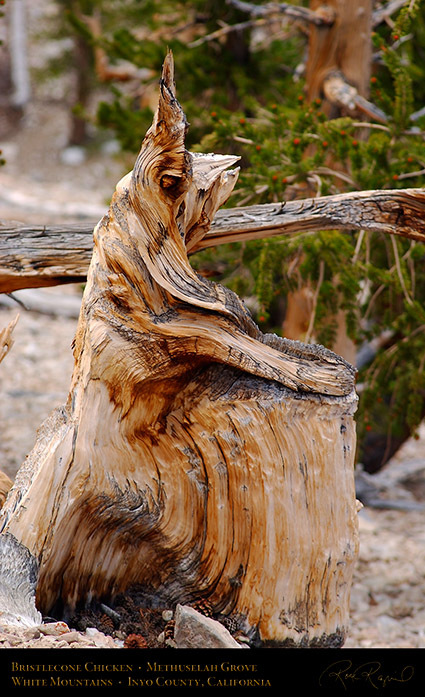 There is an even older Bristlecone Pine in the area which is over 5,064 years old (discovered in 2013). These trees were young and growing at the time stone axes were being used in Europe, the Great Pyramid of Khufu (Cheops) was being built, and cuneiform clay tablets were being used in northern Syria. 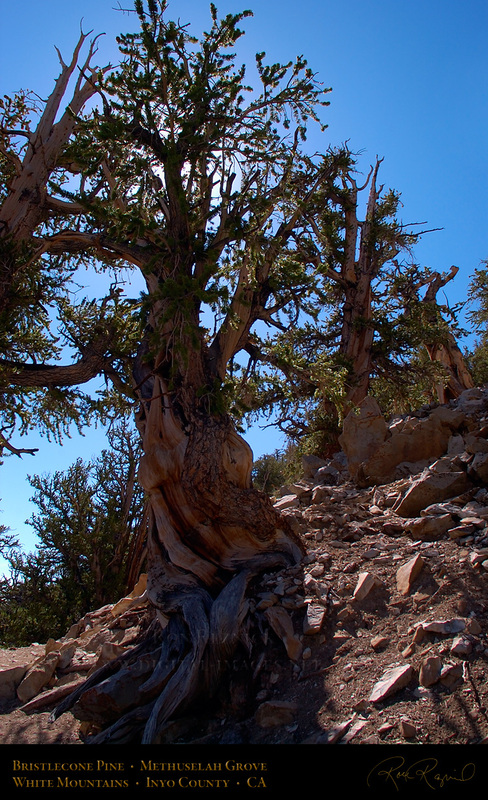 Bristlecone pines (Pinus longaeva and aristata) grow in the White Mountains at elevations 9,000 to over 11,000 feet. The oldest trees grow on outcrops of dolomite, an alkaline, low nutrient soil. These are Great Basin Bristlecone Pines (longaeva), which live far longer than the other two species (aristata and Foxtail Pine balfouriana) and grow in twisted, gnarled shapes. 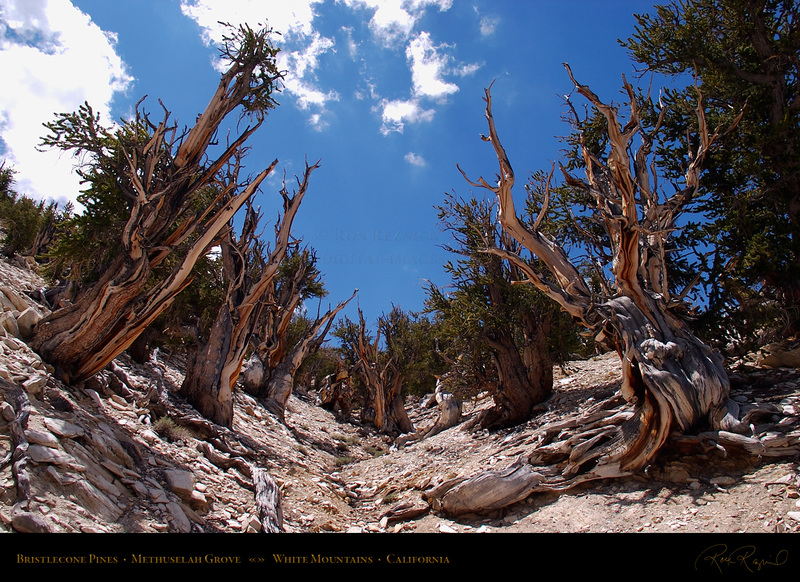 Bristlecone Pines in the Methuselah Grove high in the White Mountains near Bishop, California. 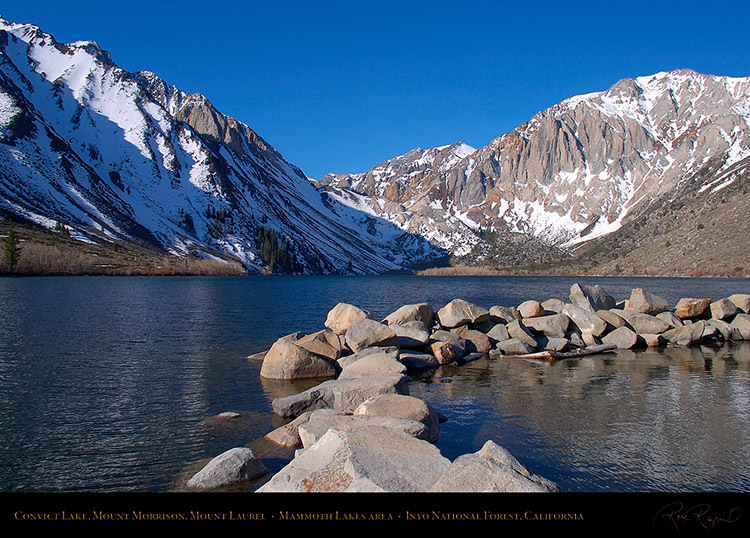 The Minarets, Mount Ritter and Banner Peak in the Ritter Range of the Sierra Nevadas. a two-shot panorama taken at sunrise from atop Mammoth Mountain. residents in Mammoth Lakes. 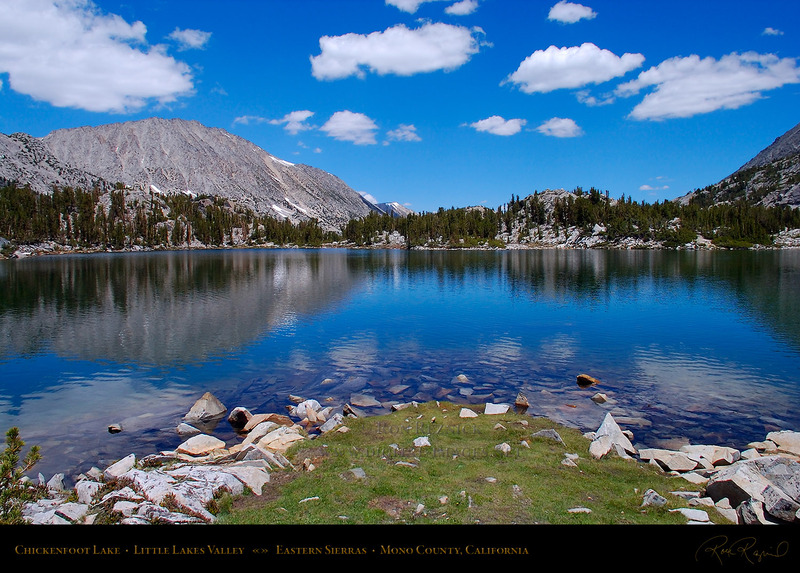 The John Muir Trail passes by many lakes in the Ritter Range. thick and cooled slowly and evenly, creating hexagonal columns (and some irregular polygons). A glacier later swept through the area and ground off the top, creating the striated flat surface. 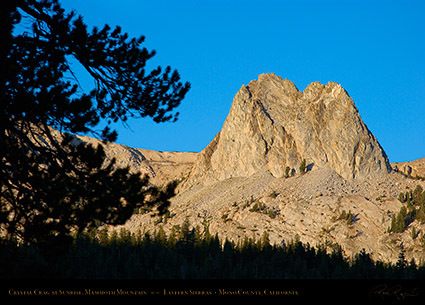 At right is Crystal Crag at sunrise, a dramatic granite monolith on the Mammoth Crest Trail. 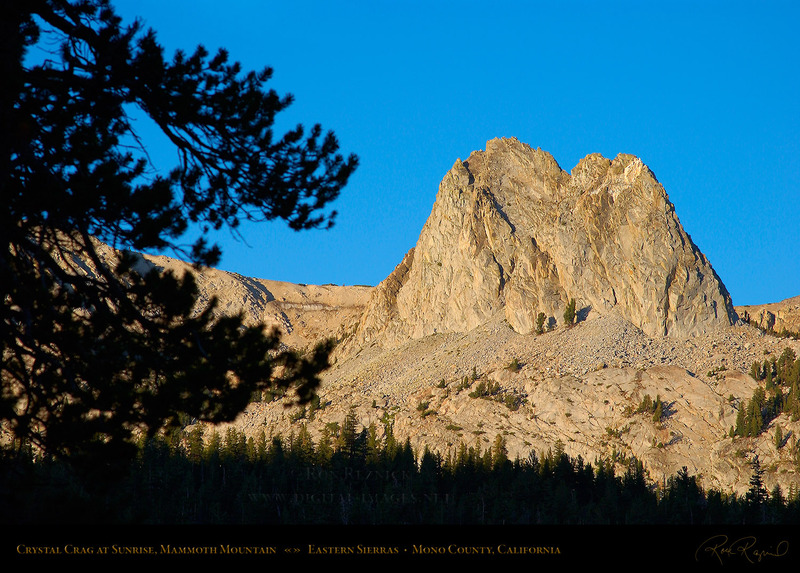 When hiking to the top of the 11,000 foot lava dome, Crystal Crag is one of the landmarks. 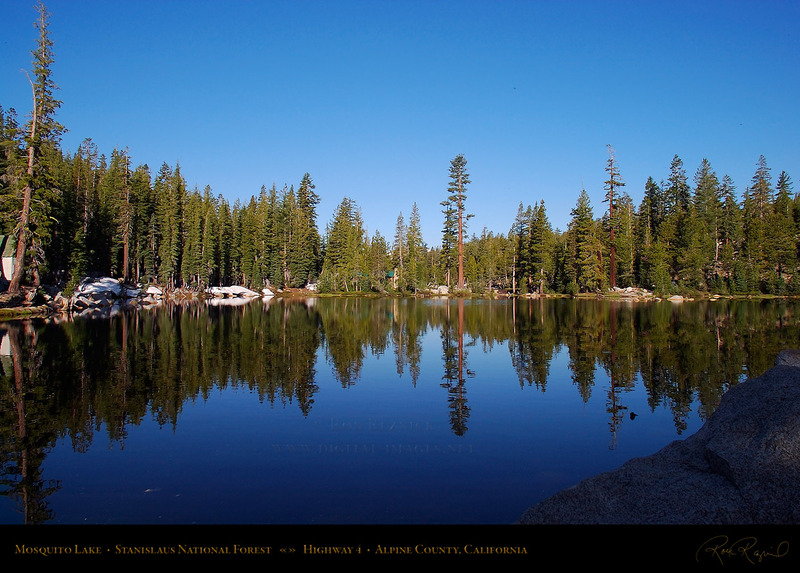 is home to the highest ski resort in California, with an average of 400 inches of snow. 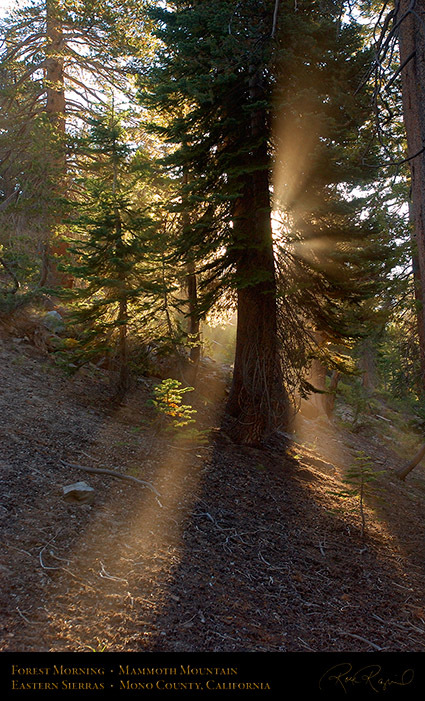 At left, rays from the rising sun part around a tree in the Ansel Adams Wilderness on Mammoth Mountain. At right, Twin Lakes from Lake Mary Road, a pair of connected lakes 8,600 feet up on Mammoth Mountain. 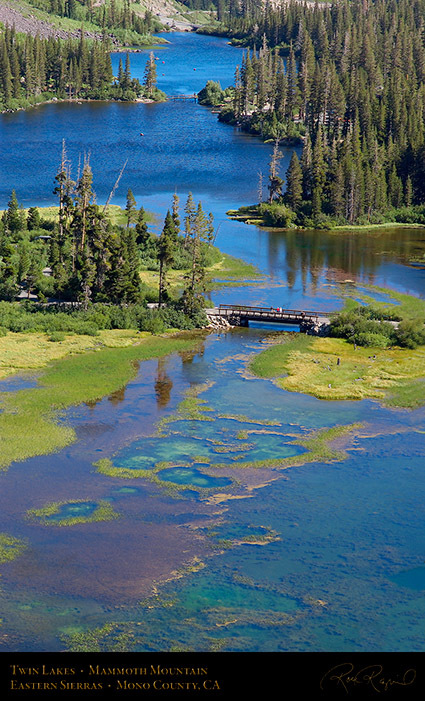 Twin Lakes, the lowest of the alpine lakes in the Mammoth Lakes Basin, are at the base of the ski area. A split Cedar with moon on the Shadow Lake Trail into the Ritter Range from Mammoth Mountain. named after an incident in 1871 when a group of convicts escaped from prison in Carson City, NV. 1951 Glenn Ford/Gene Tierney film “The Secret of Convict Lake”. The lake is well known for trout. 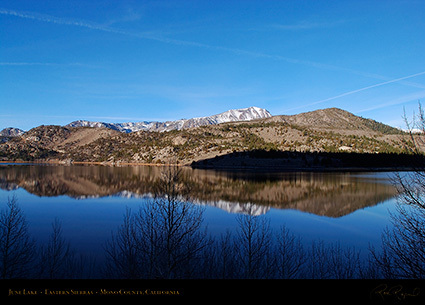 June Lake is a subalpine trout-fishing lake 20 miles north of Mammoth Lakes, 5 miles south of Mono Lake off Hwy 395. 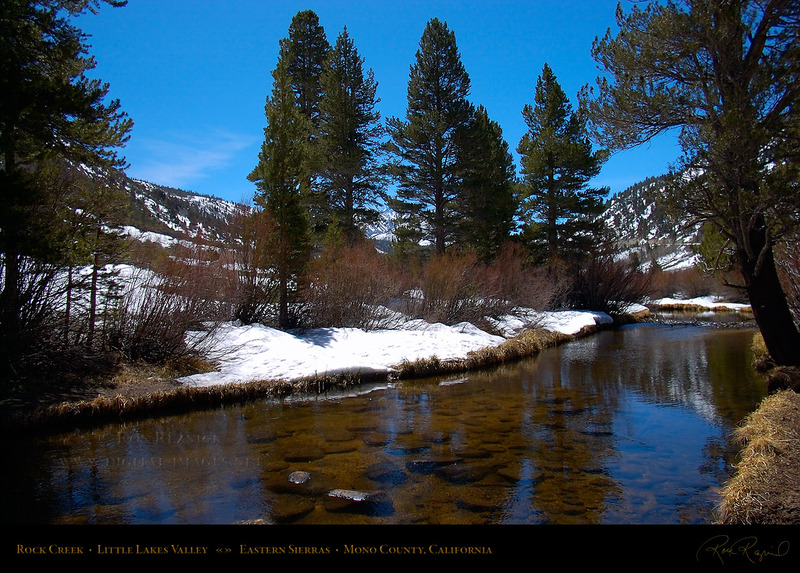 Rock Creek is a high elevation stream flowing through the Little Lakes Valley in the Eastern Sierra Nevada mountains. 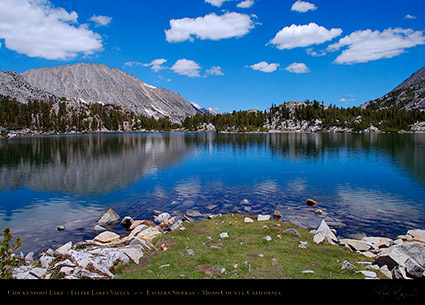 Chickenfoot Lake is at the top of Little Lakes Valley, near Morgan Pass and Sierra Crest at nearly 11,000 feet altitude. Mosquito Lake is one of two connected lakes off Highway 4 in the Stanislaus National Forest south of Lake Tahoe. 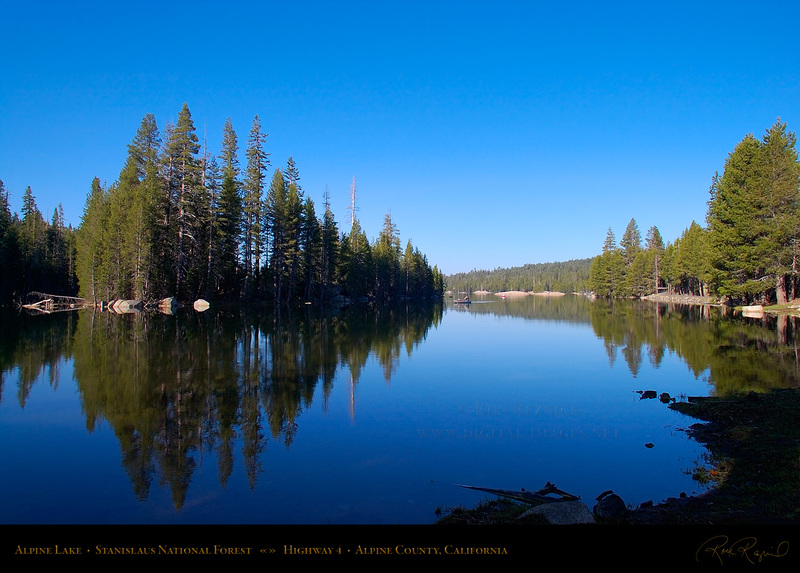 Lake Alpine, the lake is at 7,300 feet and is a popular canoeing, kayaking and fishing site in the summer. 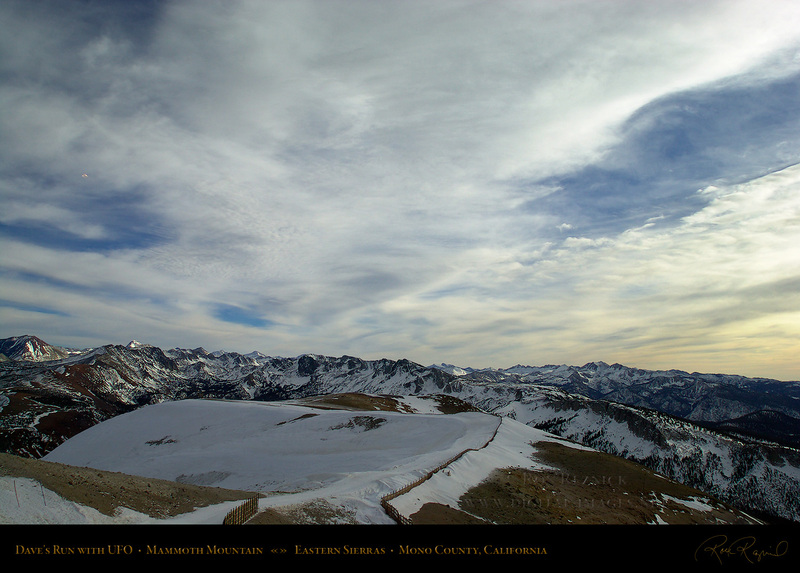 Dave’s Run from the top of Mammoth Mountain at over 11,000 feet, on a cold and windy Christmas afternoon. the UFO which appears in this image until later, when I was processing the RAW file (UFO is in the upper left). able to find out that there were no reported weather balloons in the area. 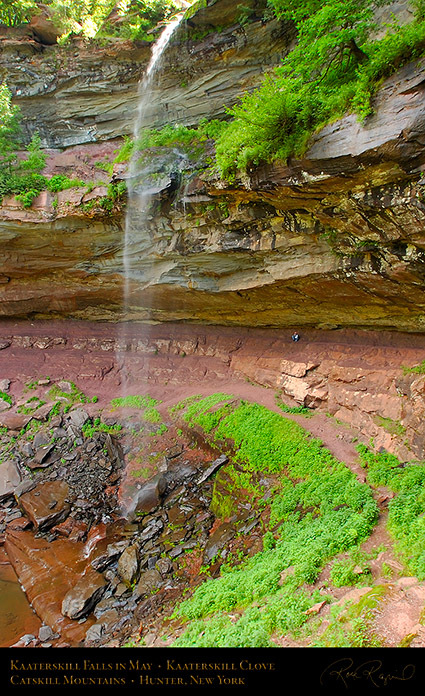 The object appears in the RAW file. 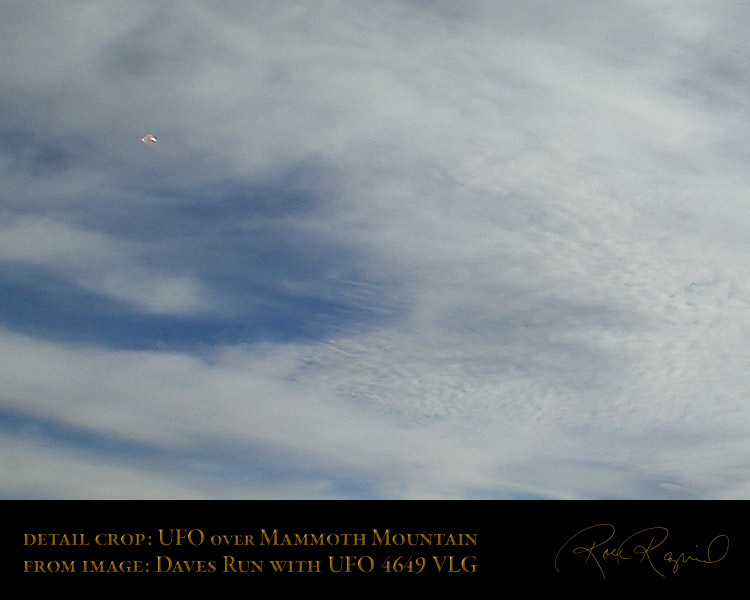 Below is a 750 pixel detail crop of the Unidentified Flying Object over Dave’s Run on Mammoth Mountain.